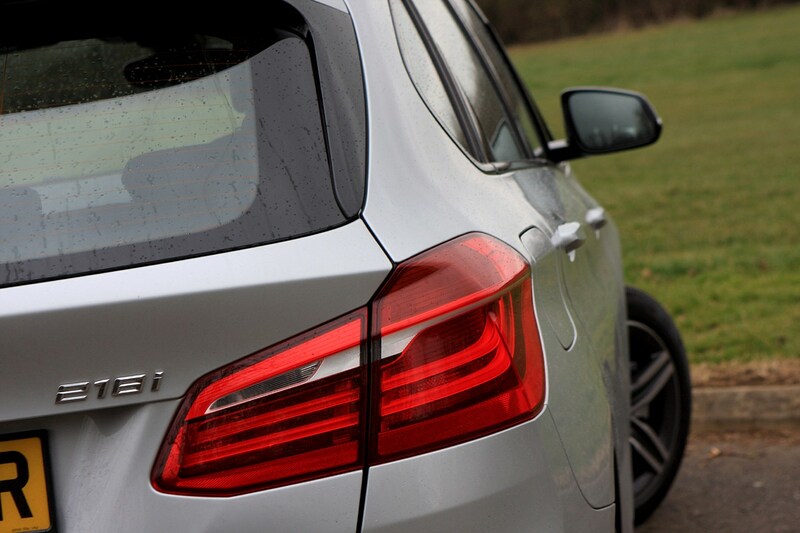 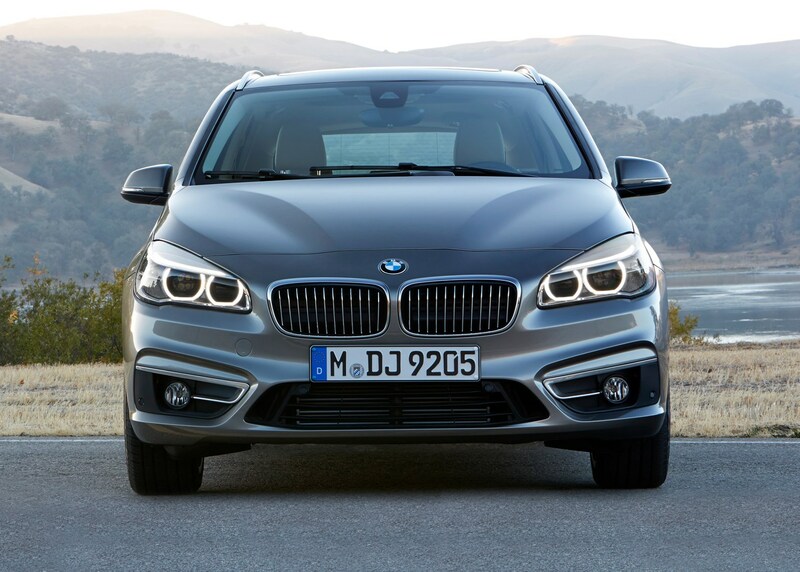 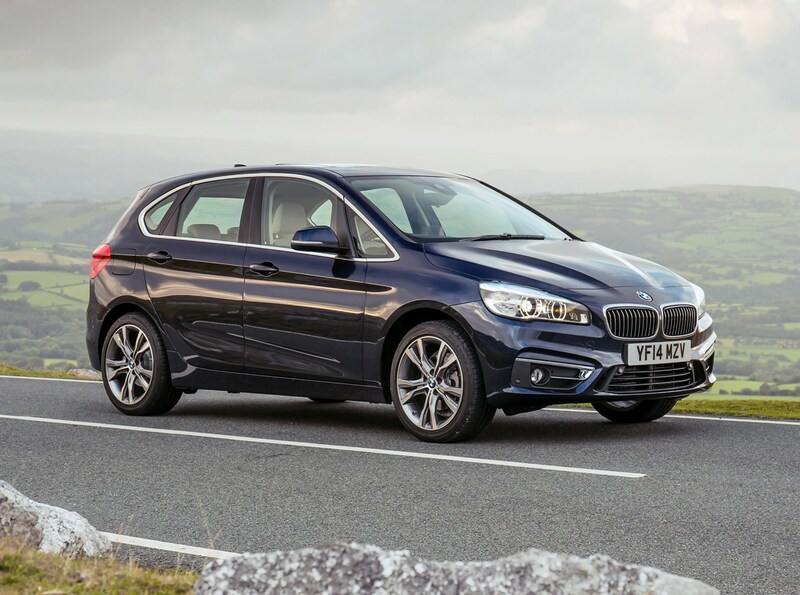 At launch there were only two engines available, and being a family car, BMW 2 Series Active Tourer performance was not a priority. 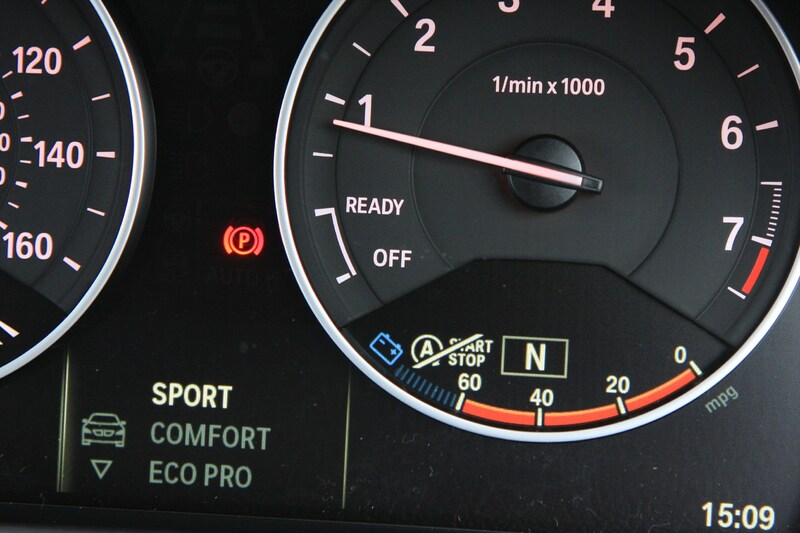 The range has subsequently expanded significantly, though. 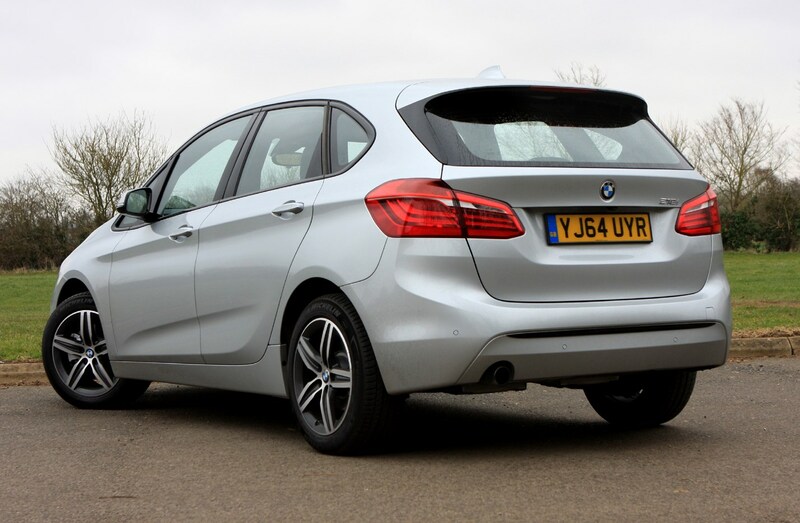 All are based on a new modular construction, either 1.5-litre three-cylinder examples or larger 2.0-litre units with four cylinders, and fitted transversely (sideways rather than lengthways) under the car’s bonnet. 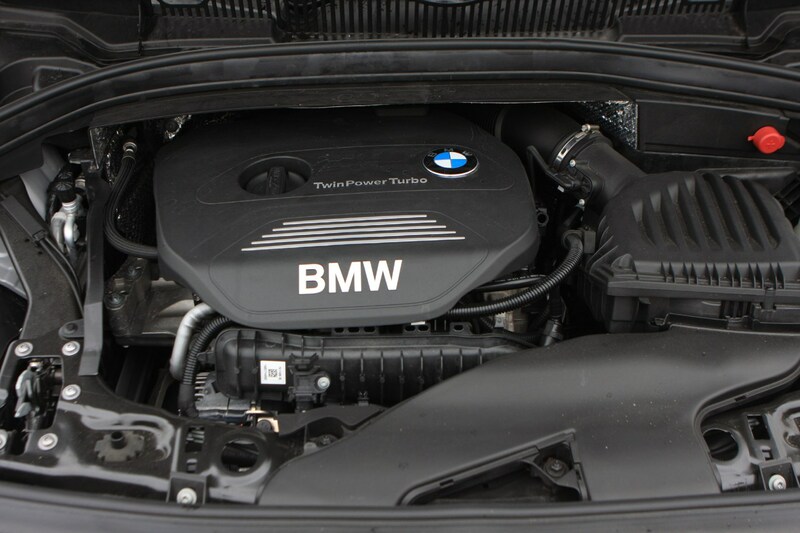 In 2016 a plug-in hybrid was introduced. 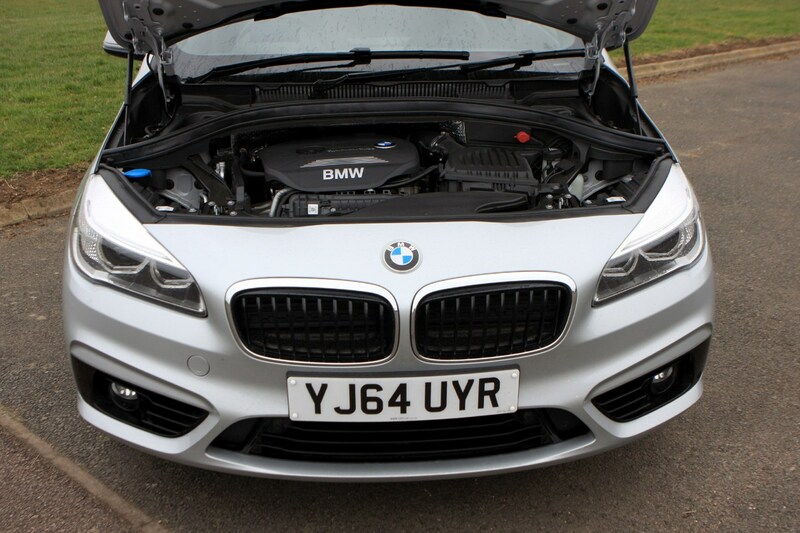 The 218i, which is actually a 1.5-litre three-cylinder turbocharged petrol engine, produces 136hp and can sprint from 0-62mph in just 9.2 seconds. 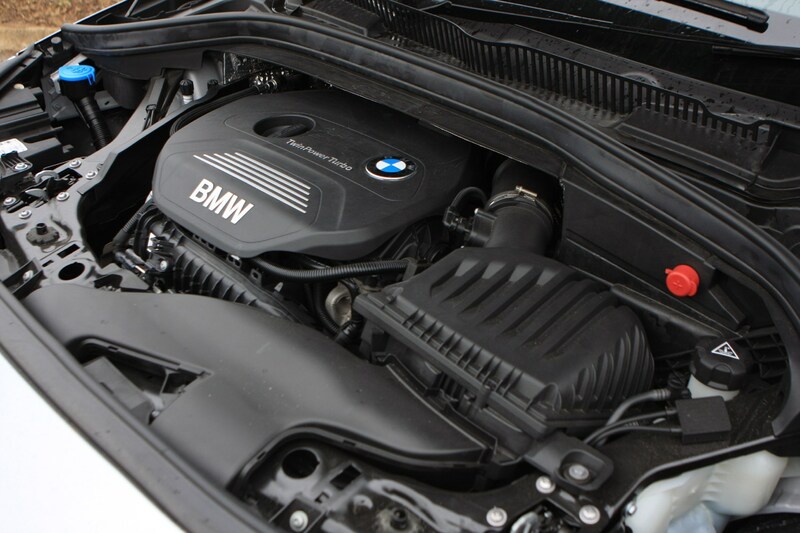 It’s an incredibly refined unit, without any giveaway that by most conventions it is missing a cylinder, and responds perfectly perkily from low-down in the rev-range – though it does its best higher up the rev-range. 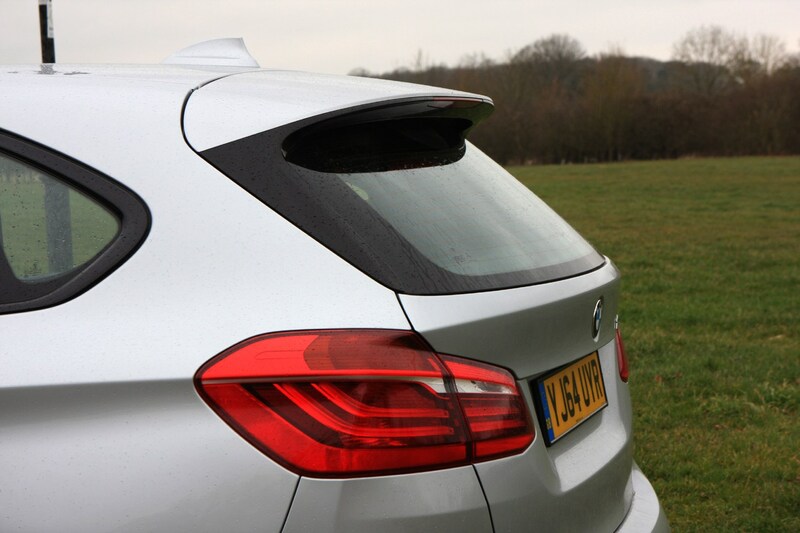 Equally hushed at speed, 2 Series Active Tourer owners will be more worried about refinement than straight-line performance. 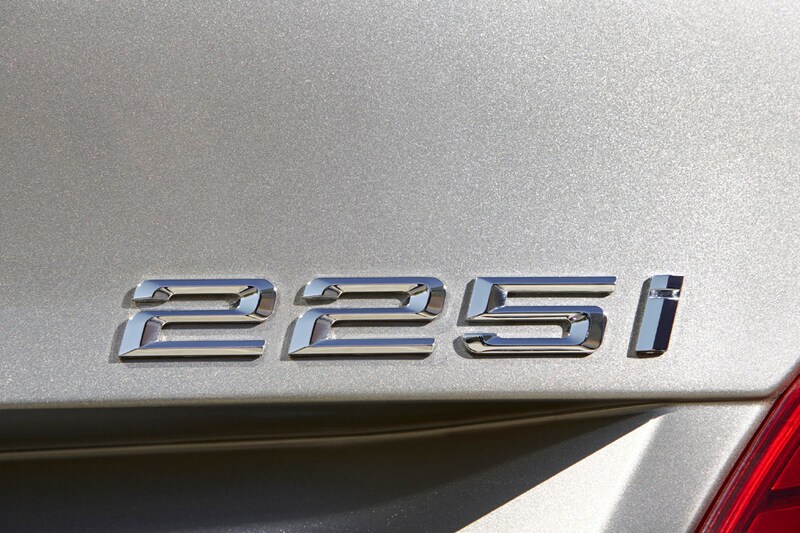 Those that do crave more had to wait until November 2014, when the 218i was supplemented by the 220i and 225i, although the latter was discontinued in the UK during 2017. 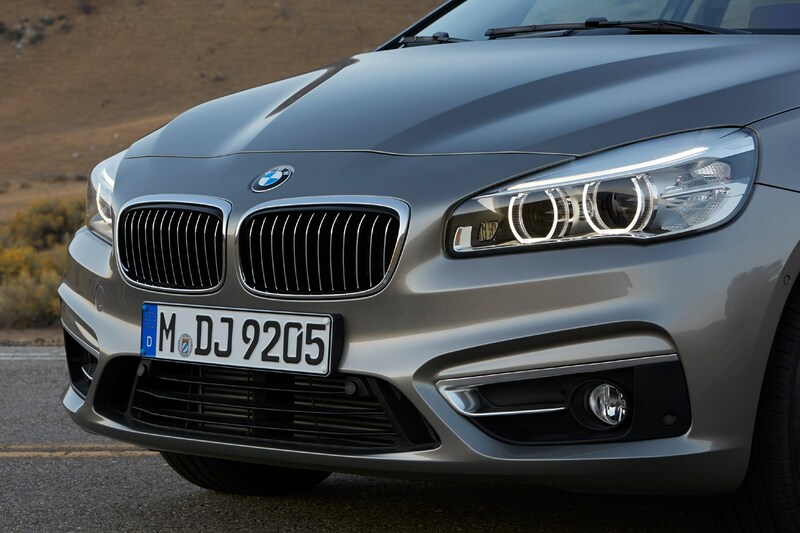 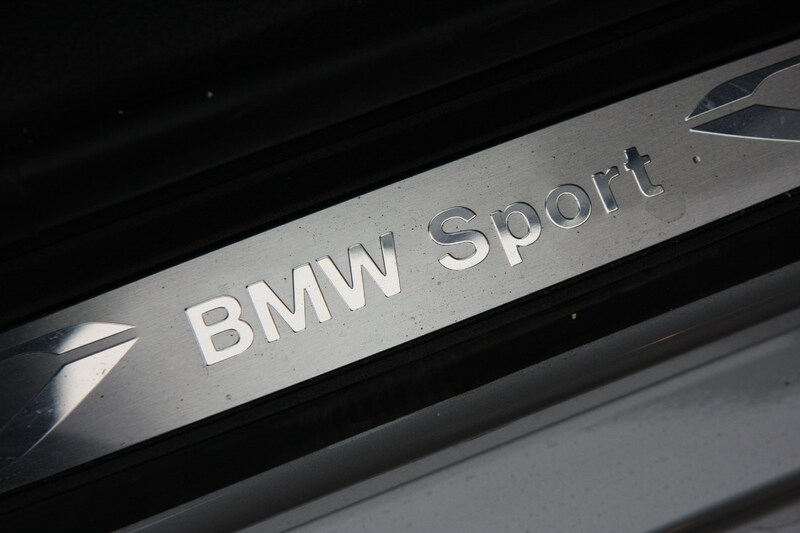 Both have the 2.0-litre, four-cylinder engine, the 225i with 230hp and xDrive four-wheel drive. 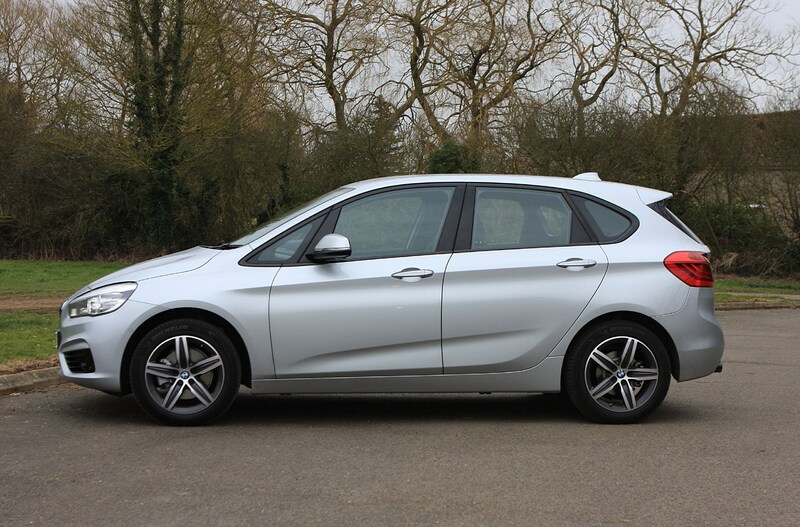 If economy and efficiency, with a lower list price than the hybrid, are your priorities then it’s the 218d that will likely catch your eye. 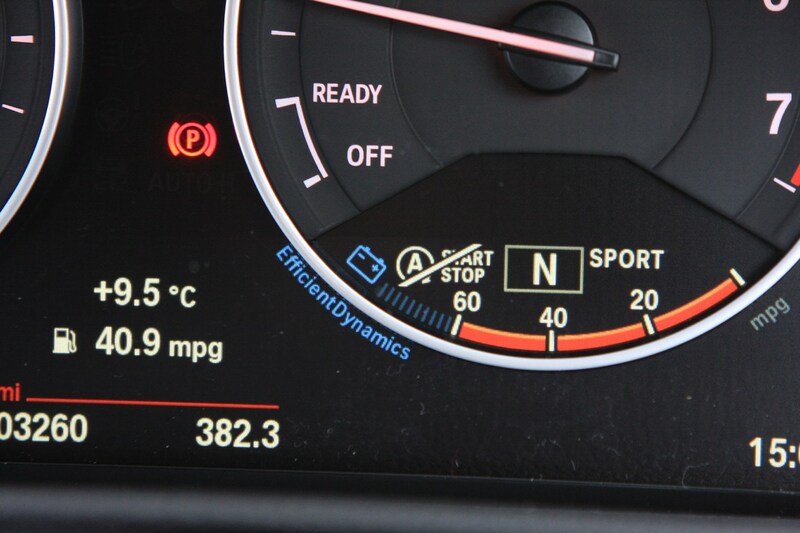 This 2.0-litre four-cylinder diesel manages to emit only 109g/km but can sprint from 0-62mph in 8.9 seconds, thanks to its 150hp and 330Nm of torque. 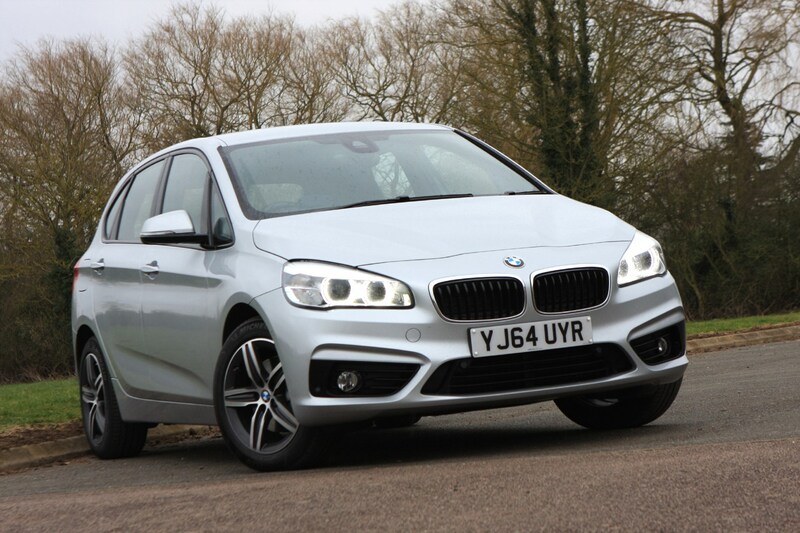 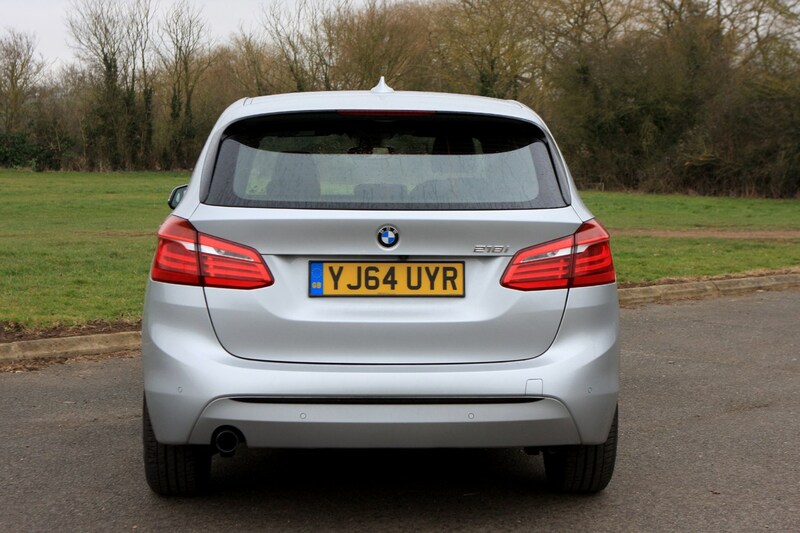 The three-cylinder petrol has it licked for refinement, though the diesel does feel more willing on the move. 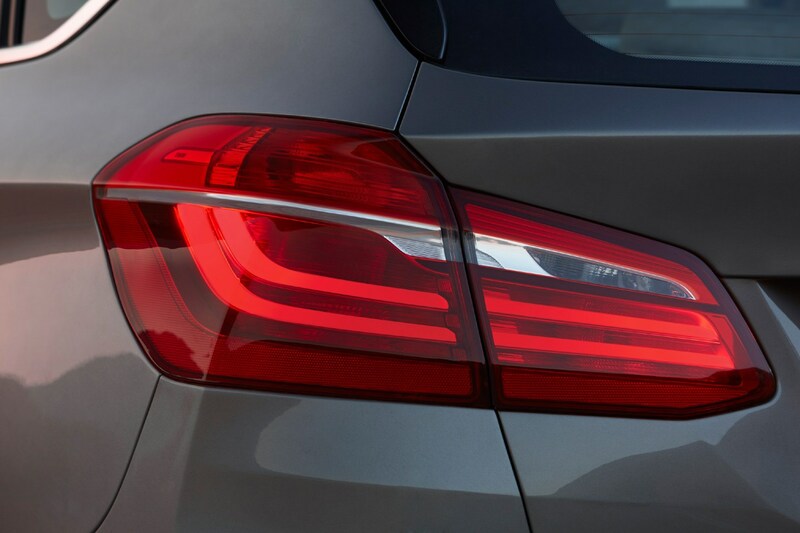 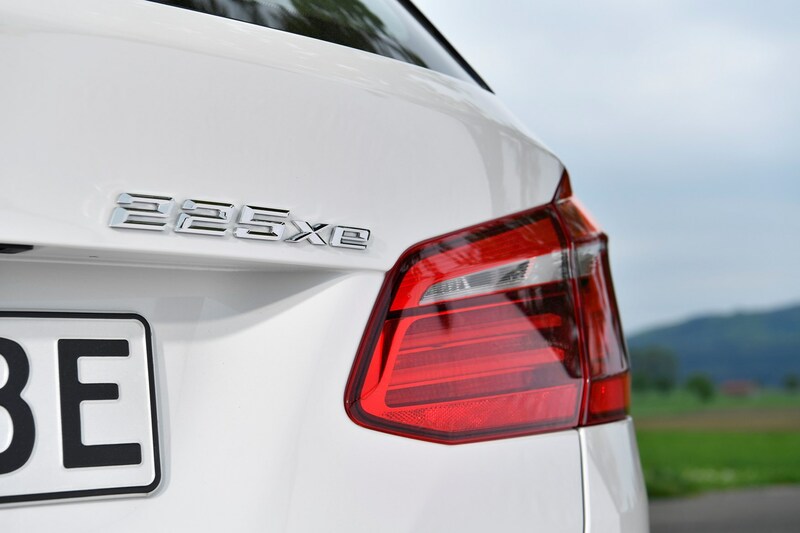 Like the petrol engines, the diesel line-up was expanded in November 2014 by the 216d (three-cylinder 1.5-litre) and 220d (with a higher output version of the 218d’s engine). 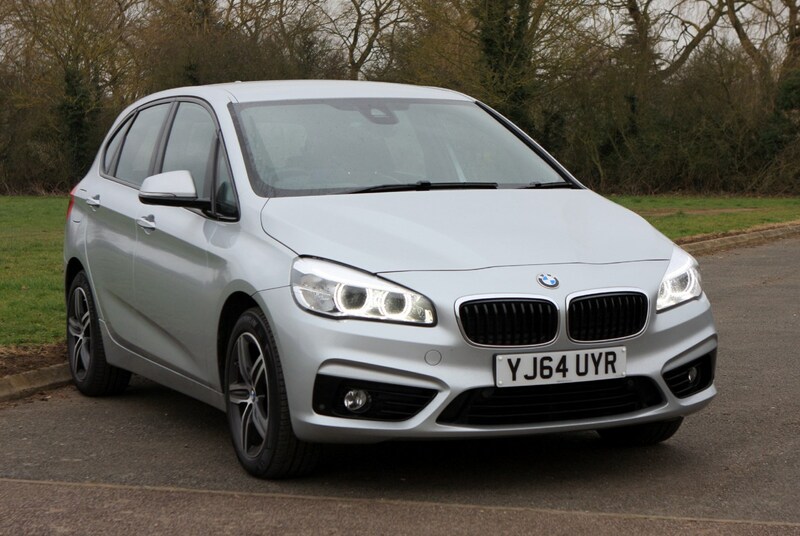 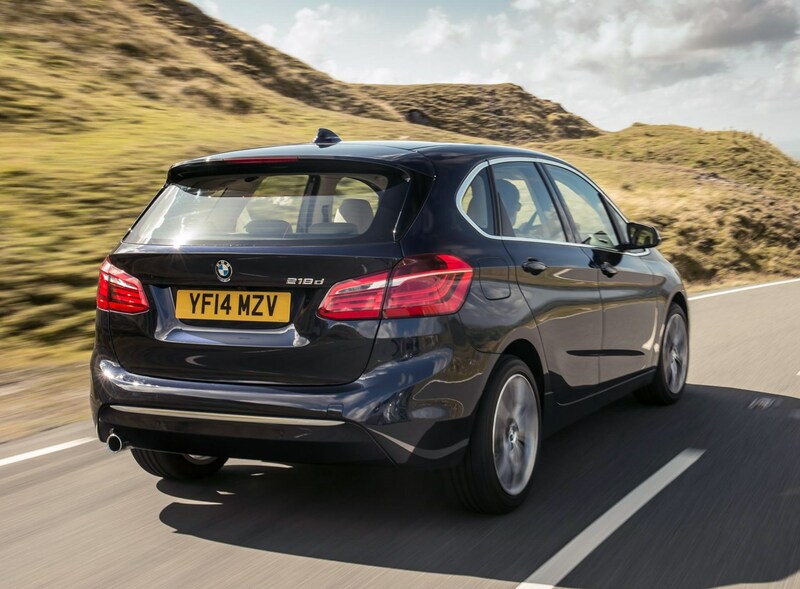 Should you wish the 220d is also available with xDrive – where it is fitted with the eight-speed automatic gearbox as standard. 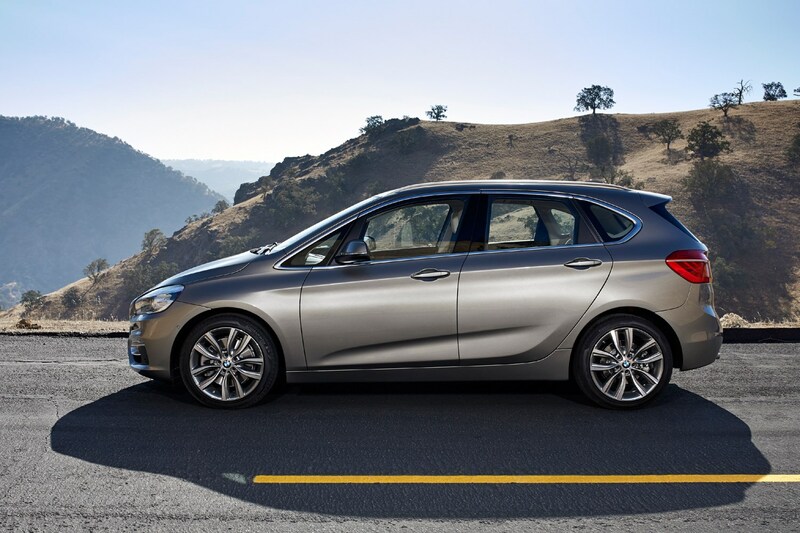 Don’t be fooled by the 225xe badging – the plug-in hybrid (PHEV) version of the 2 Series Active Tourer uses technology from the i8 sports cars, with the three-cylinder 1.5-litre petrol engine powering the front axle twinned with an electric motor driving the rear wheels. 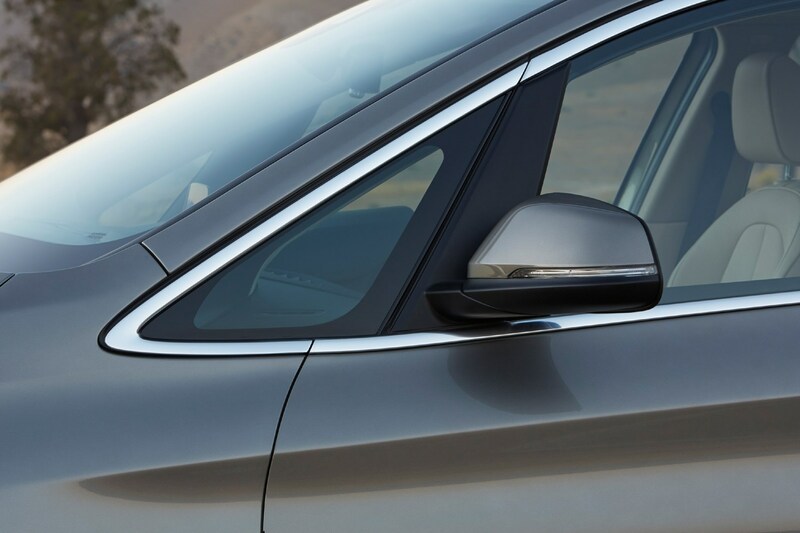 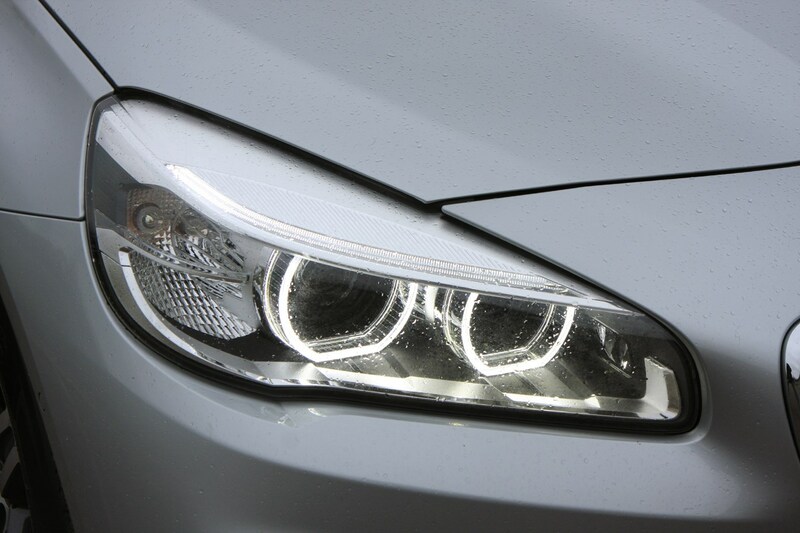 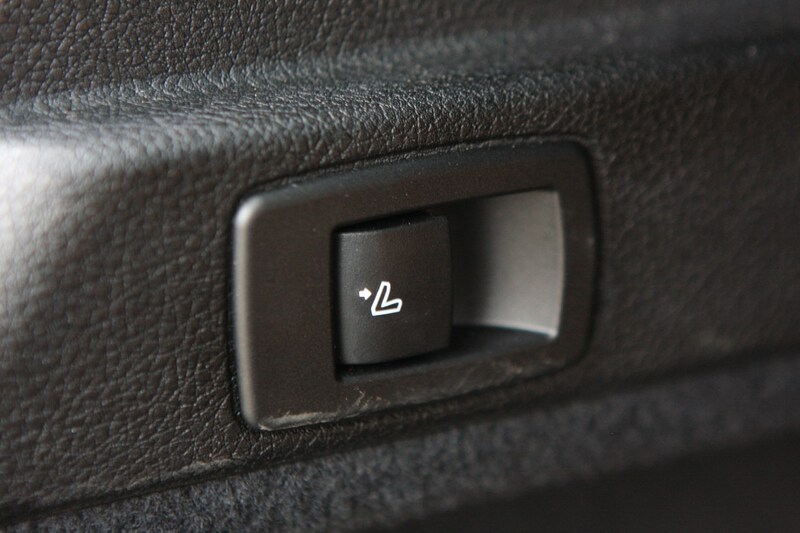 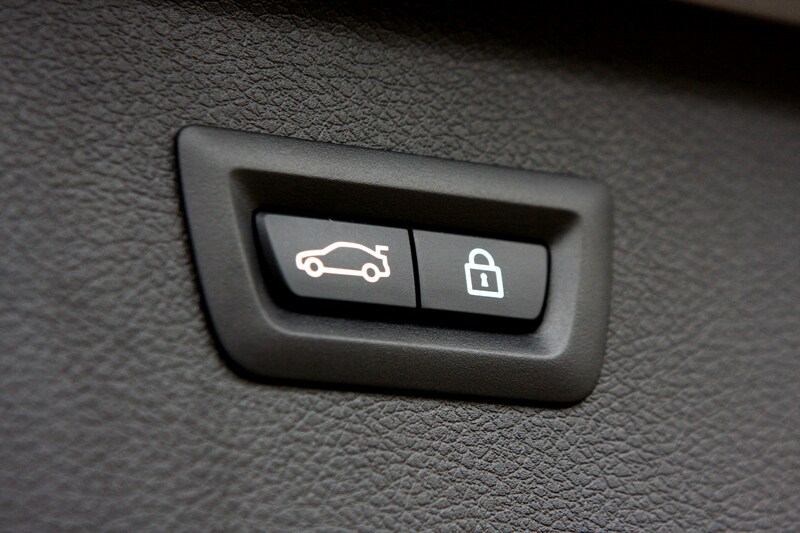 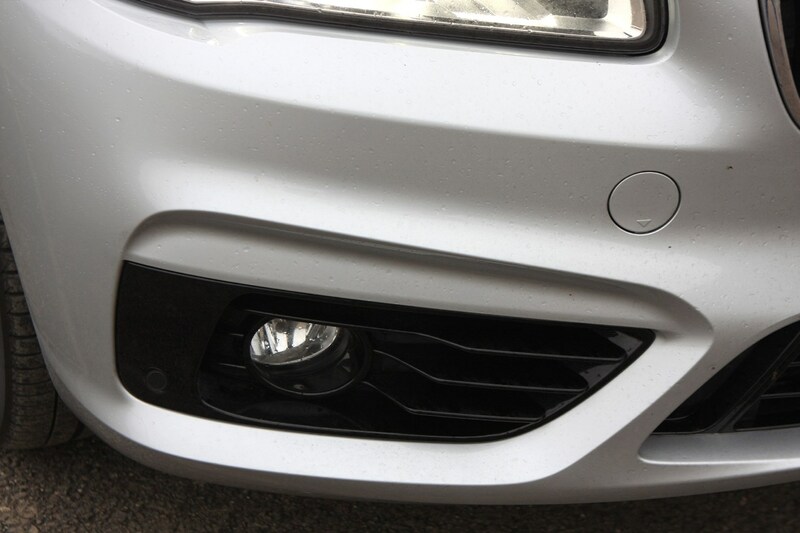 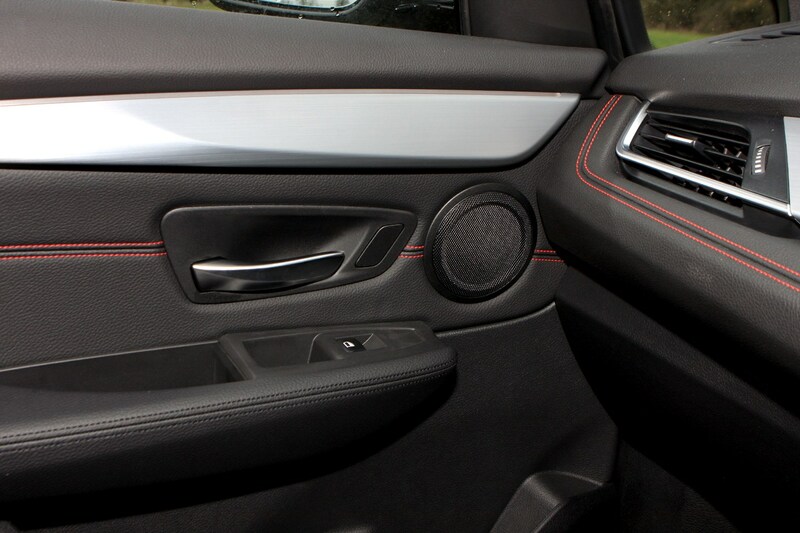 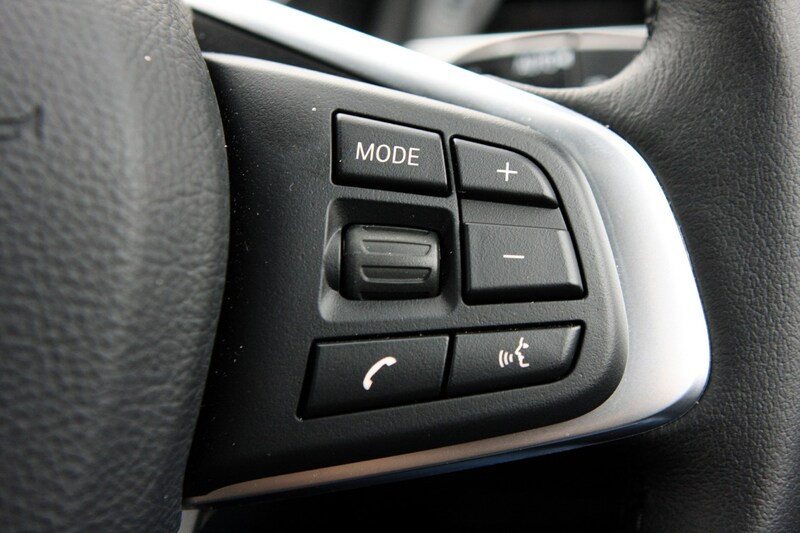 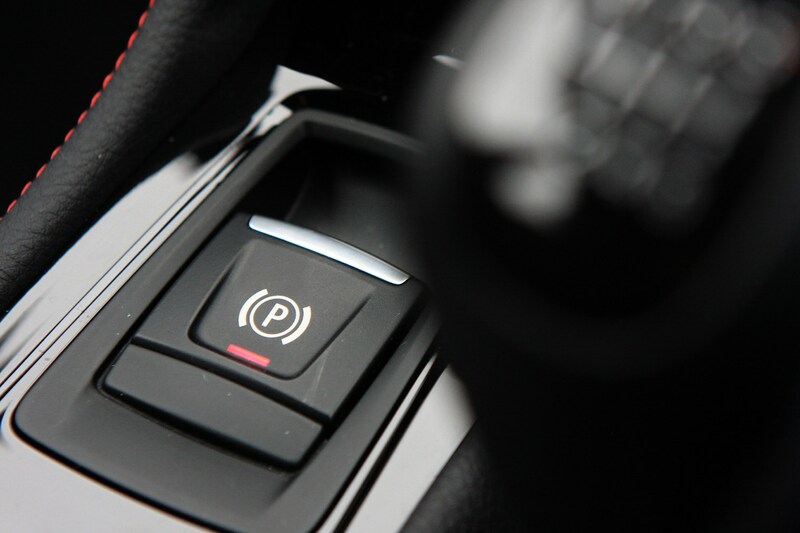 In the main it’s smooth and simple to drive, with near-instant response thanks to its electrical assistance. 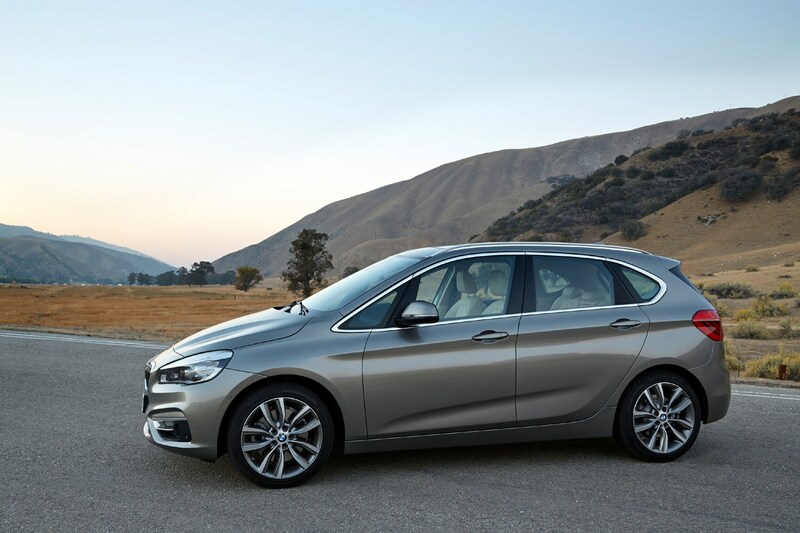 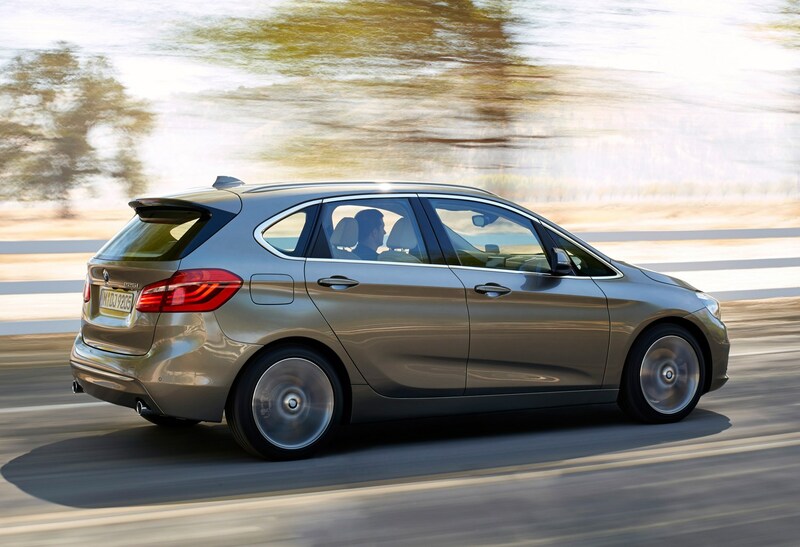 There are four gearboxes to choose from depending upon the age of the 2 Series Active Tourer; the especially smooth and efficient eight-speed automatic, and for three-cylinder engines a six-speed version. 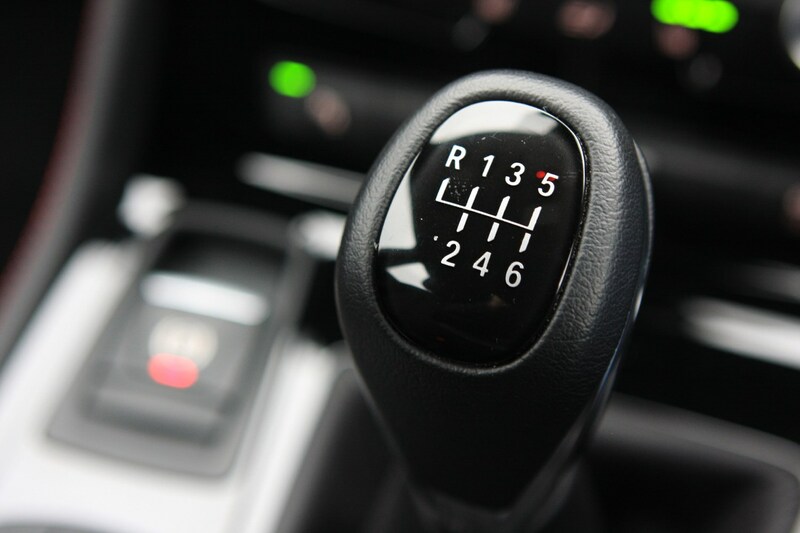 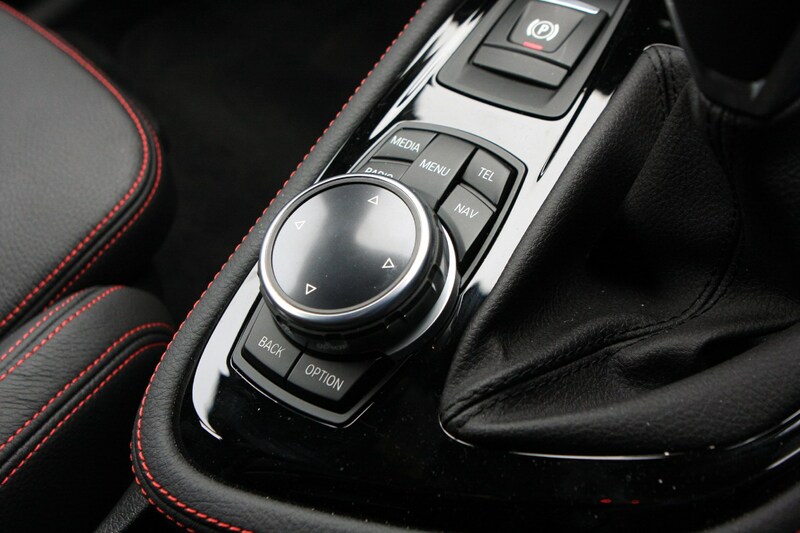 Those who prefer to swap cogs themselves will find BMW’s six-speed manual gearbox instead, which is easy to use with a short throw and relaxed shift action. 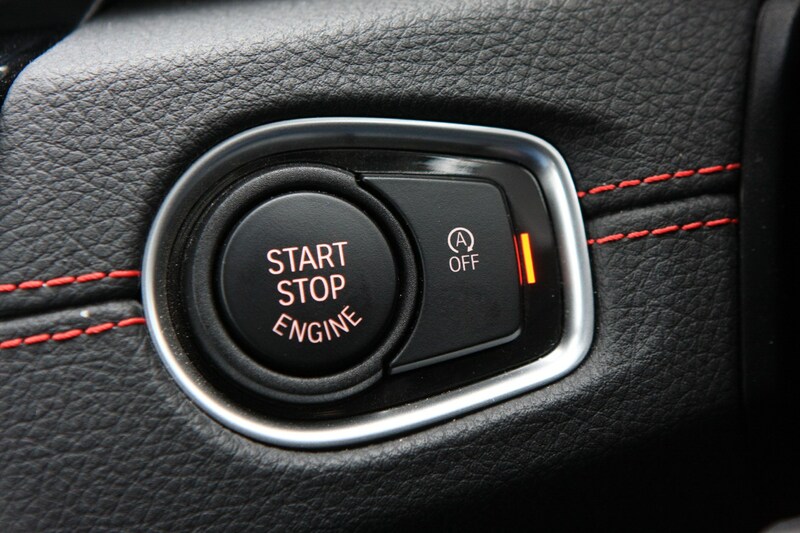 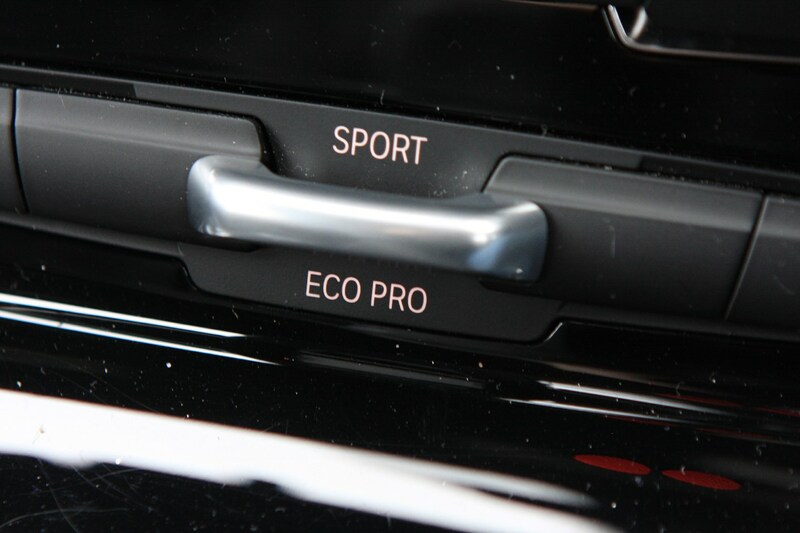 A seven-speed dual-clutch automatic was added during 2018’s facelift. 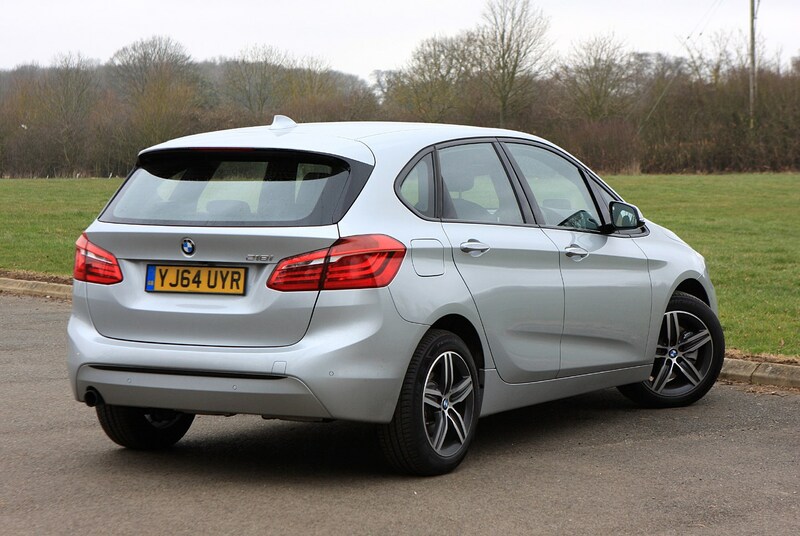 Once regarded - or at least marketed - as the ‘ultimate driving machine’, the introduction of a front-wheel drive BMW, and specifically a compact people carrier, shocked the the marque’s purists. 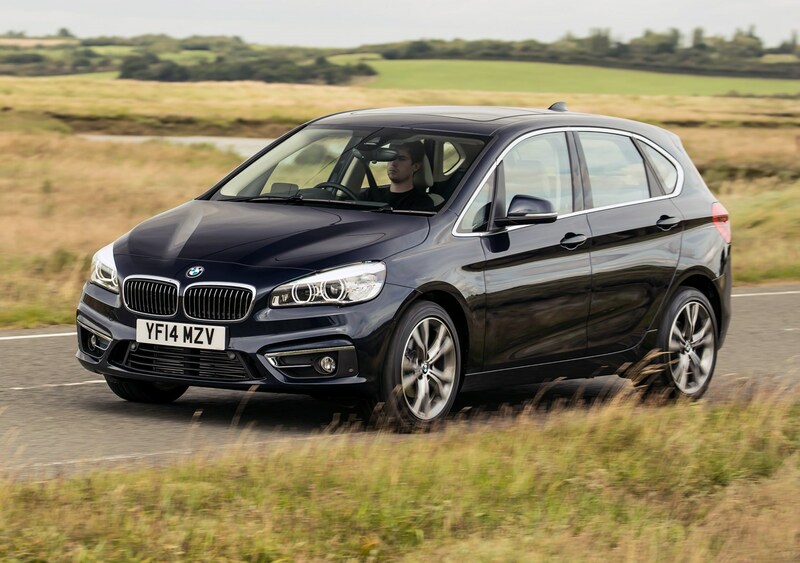 However, if you’re a fan of the firm’s products and their driving appeal, then fear not; while the 2 Series Active Tourer won’t trouble an M3 around a racetrack, it is sharper than many of its family-orientated competitors. 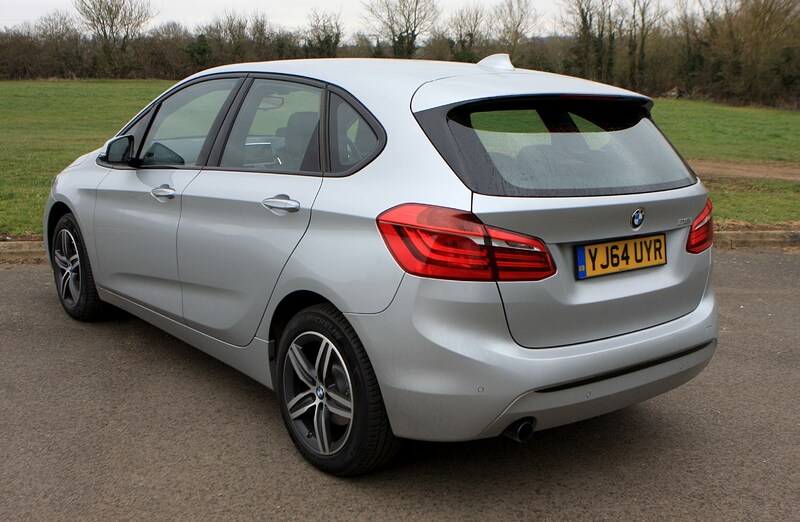 In fact it still feels like a BMW to drive, despite the change in engine and transmission layout, and for most drivers you’d be hard-pushed to notice the rear wheels aren’t being driven. 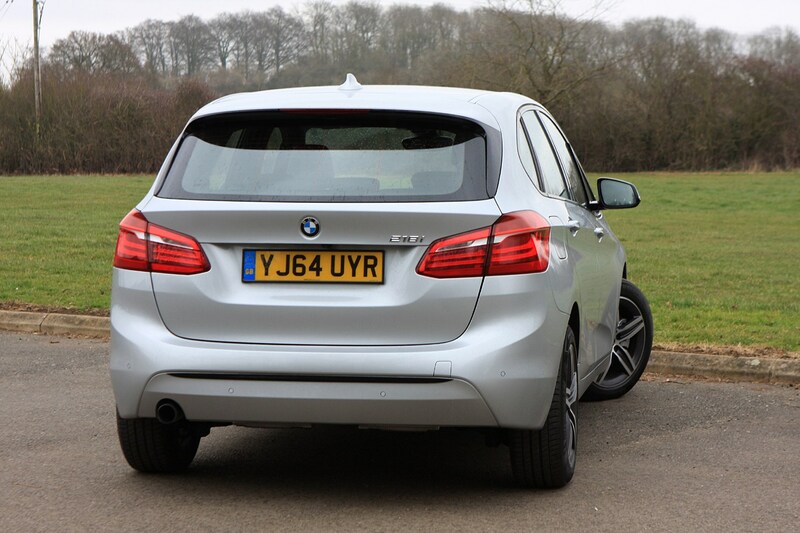 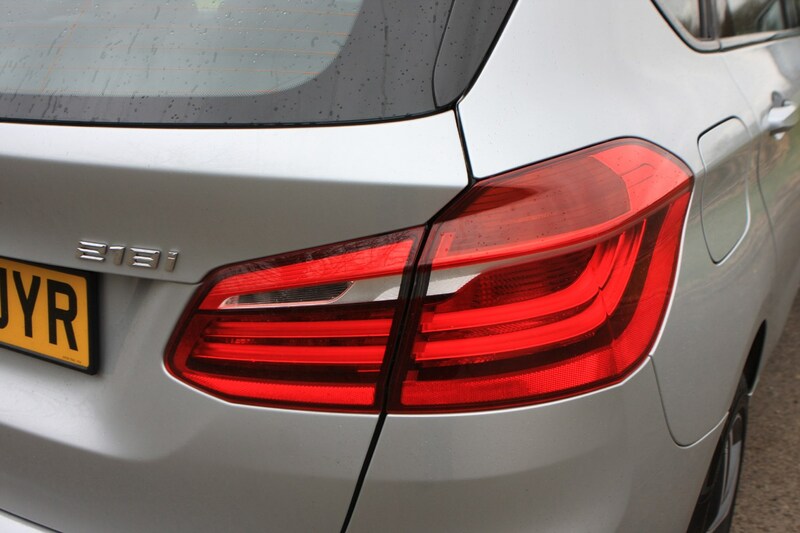 Plus four-wheel drive xDrive models were made available (225i and 220d) shortly after the initial launch. 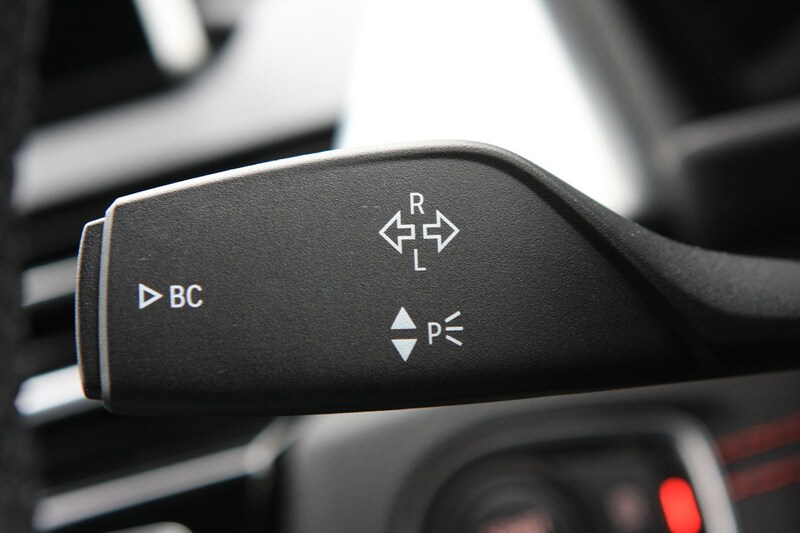 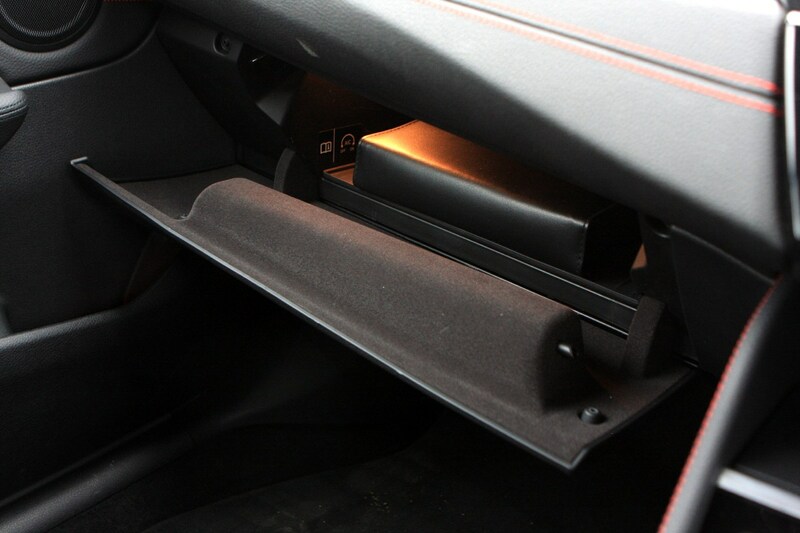 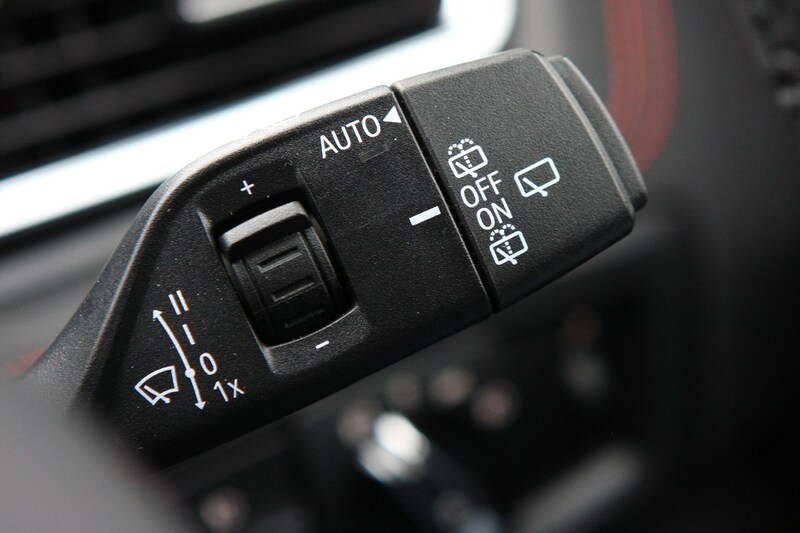 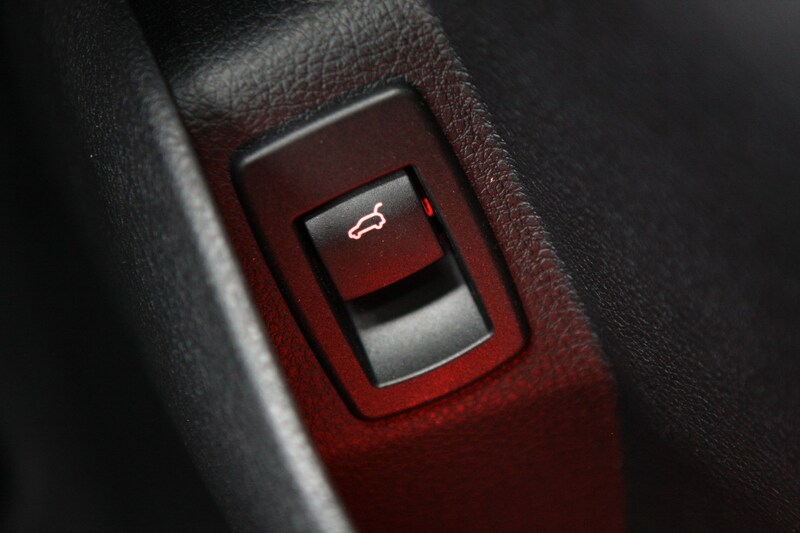 The optional Electronic Damper Control (adaptive suspension), which allows drivers to tailor the car’s responses to their requirements – and road conditions is a worthwhile extra. 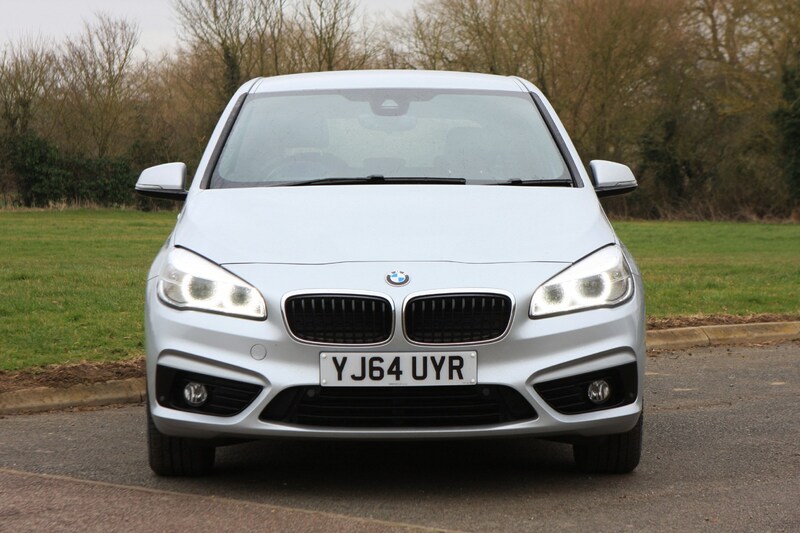 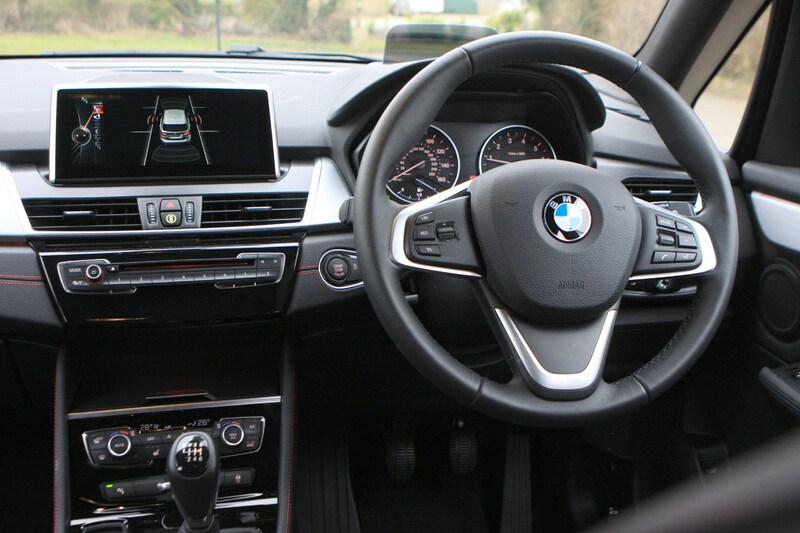 Variable Sports Steering is also optional, and from experience of other BMW products with this fitted it will make a noticeable difference for keen drivers – even if that’s not really who this vehicle is aimed at. 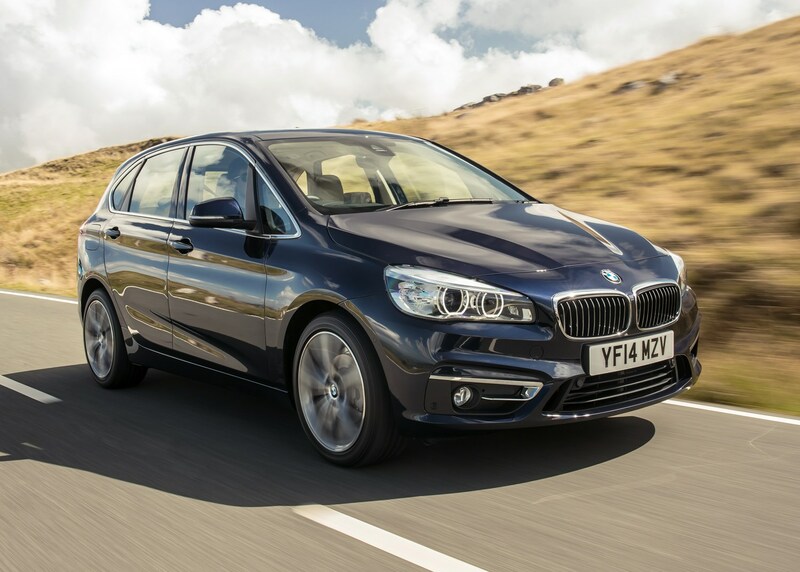 Regardless, body control is excellent and the 2 Series Active Tourer corners flatly and without fuss, even at speed – it’s easily as good to drive as the Ford C-Max or Golf SV. 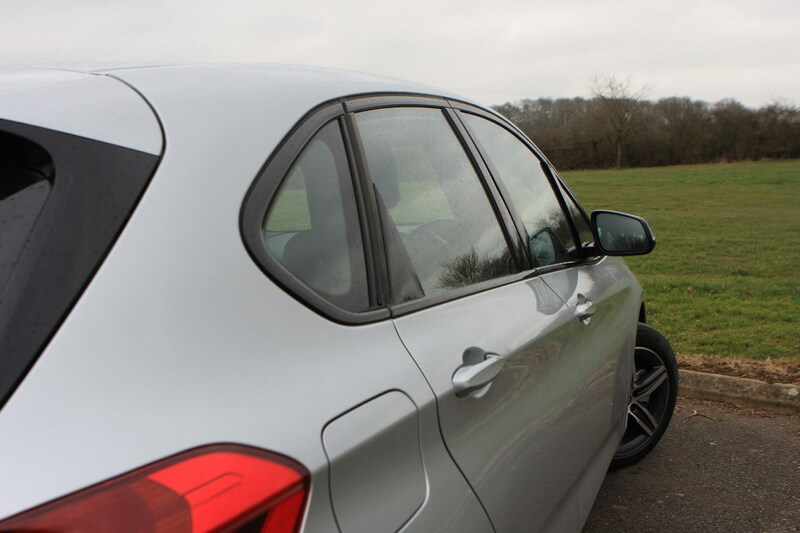 That’s despite the car’s 1,563mm height, and in part down to the wide (1,561mm front and 1,562mm rear) distance between left and right wheels. 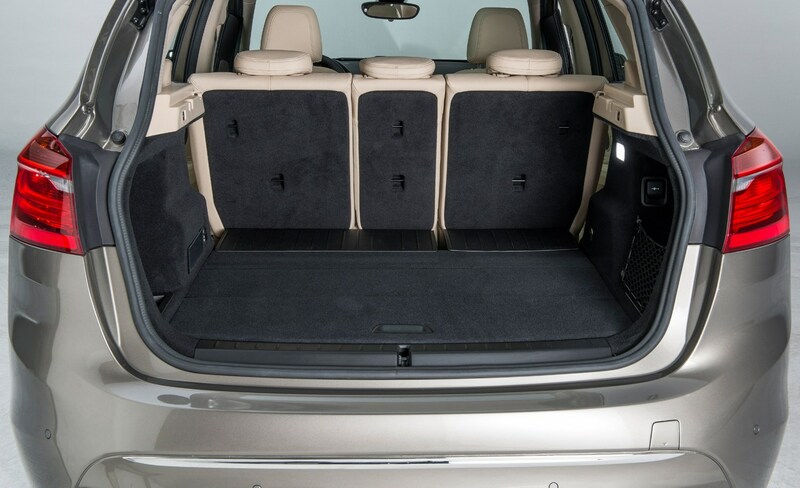 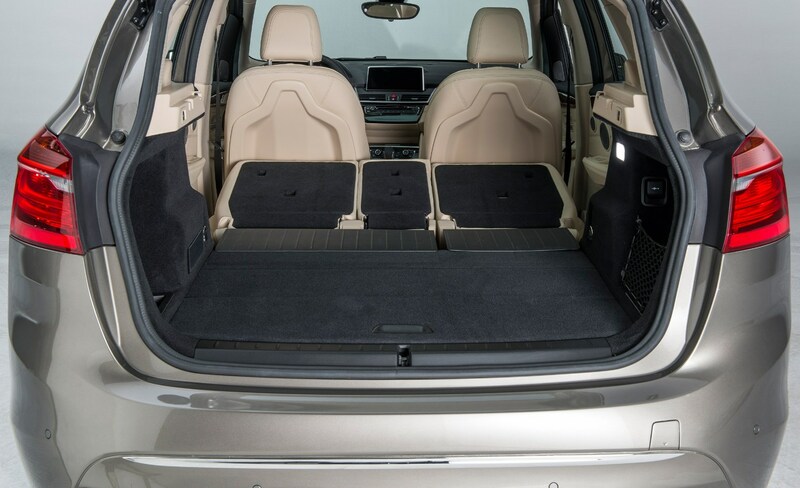 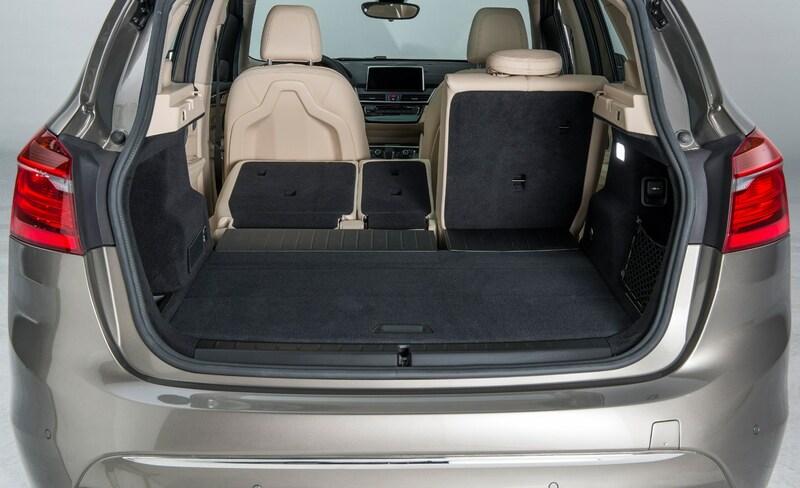 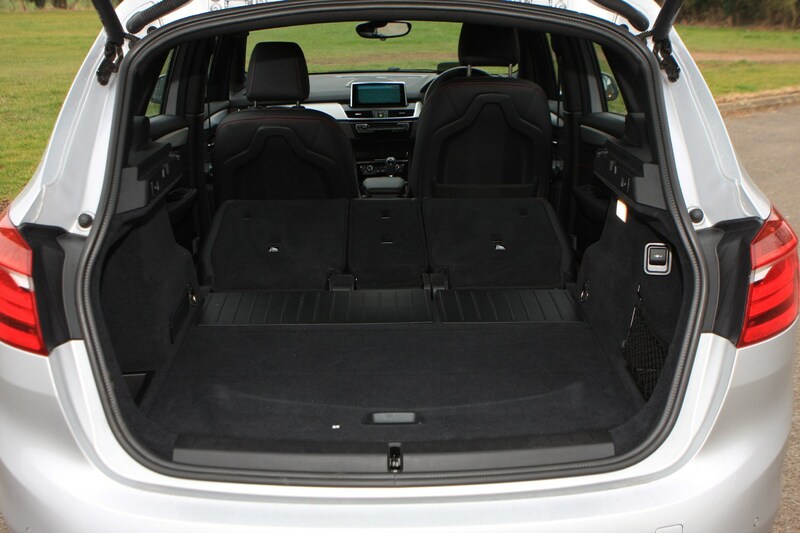 There is however firmness to the chassis that never quite goes away, which means the Citroen C4 SpaceTourer has a more comfortable ride. 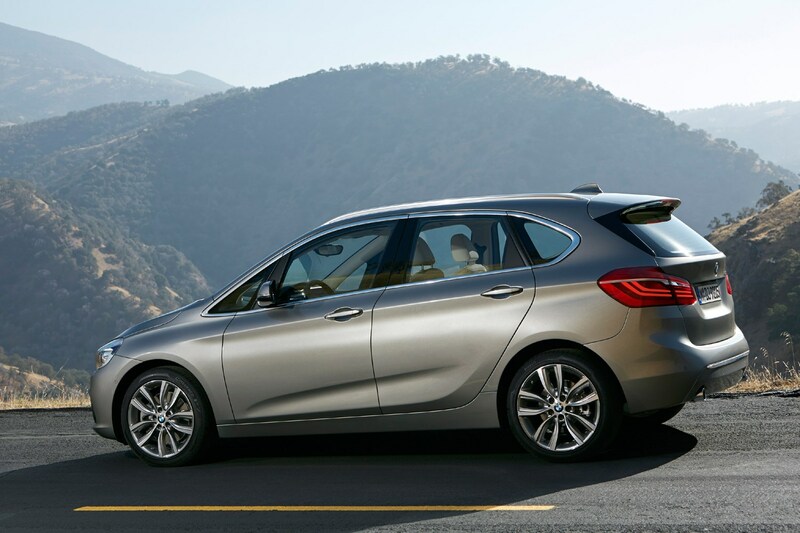 As expected, the 2 Series Active Tourer comes complete with BMW’s electronic stability control system, but like its X-badged SUV models (X1, X2 and X3, for example) you can’t fully disengage the system – but then not many of these compact people carriers will venture onto a track. 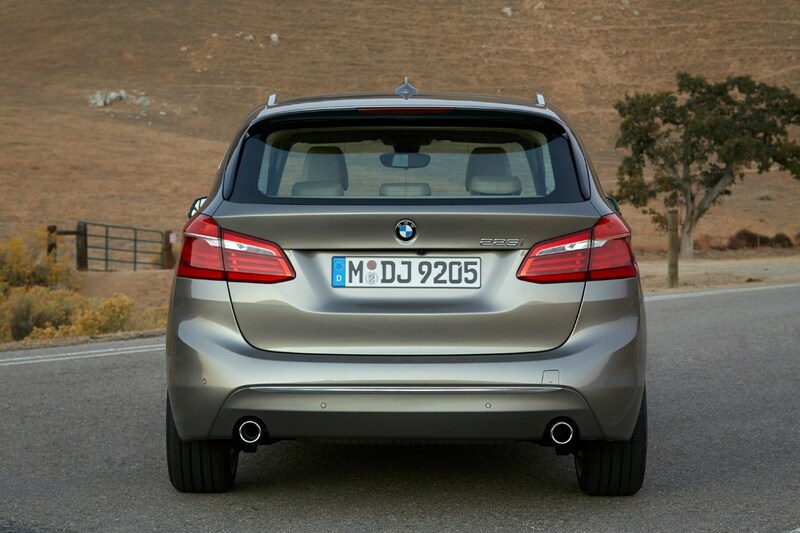 Overall, the experience is a good one. 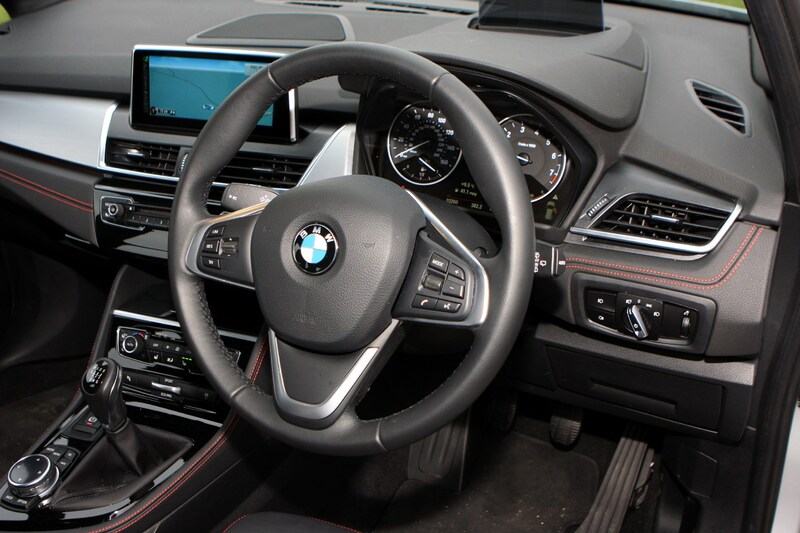 We like the weighting of the steering and it’s simple enough to park, too, with good visibility around the car thanks to lots of glass. 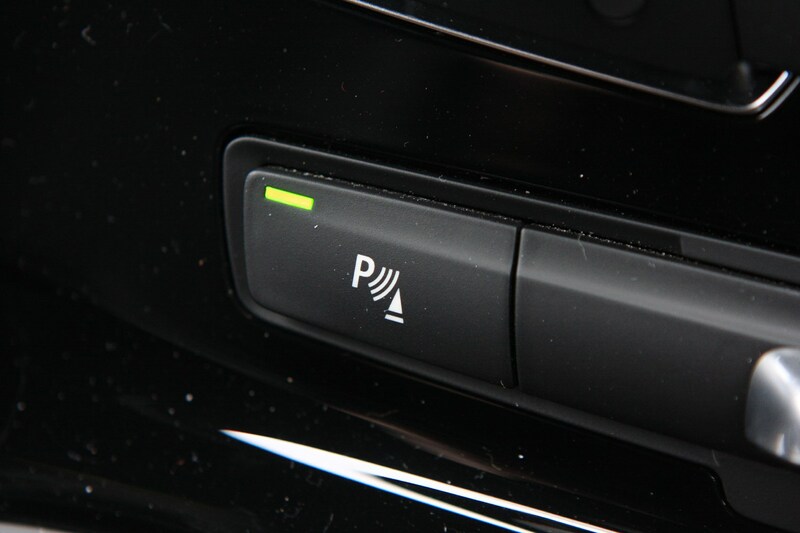 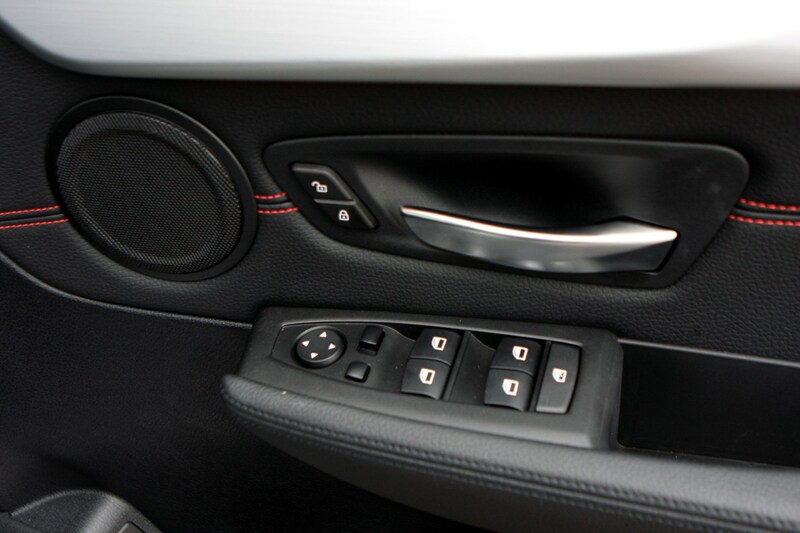 Acoustic sensors or automatic parking are available as you climb the trim structure. 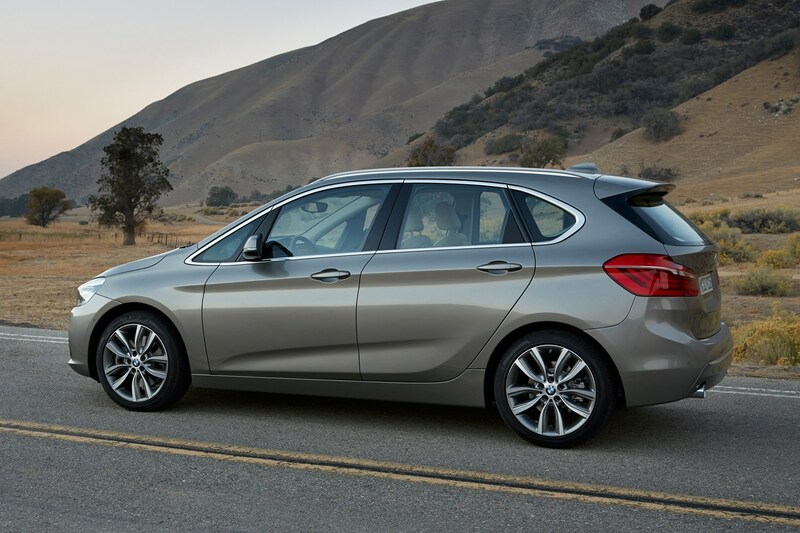 BMW expects around 75% of 2 Series Active Tourer buyers to come from conquest sales, but for the other quarter coming from the firm’s other models, the cabin layout will be relatively familiar. 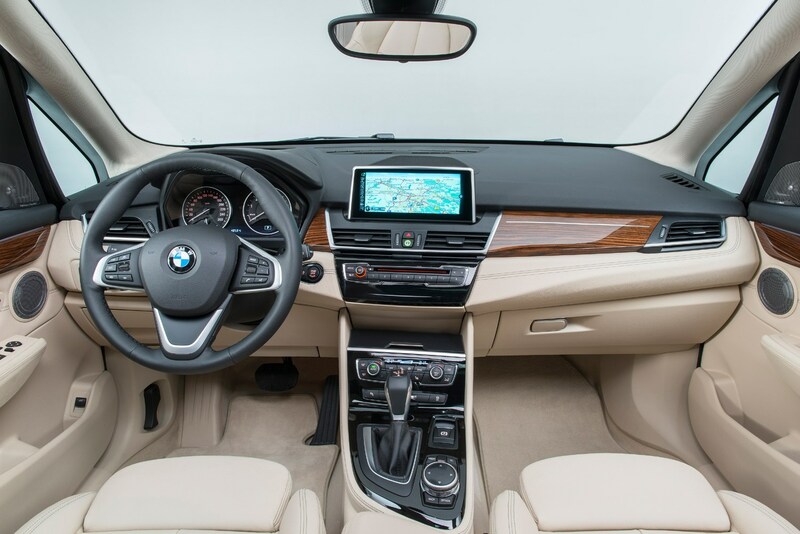 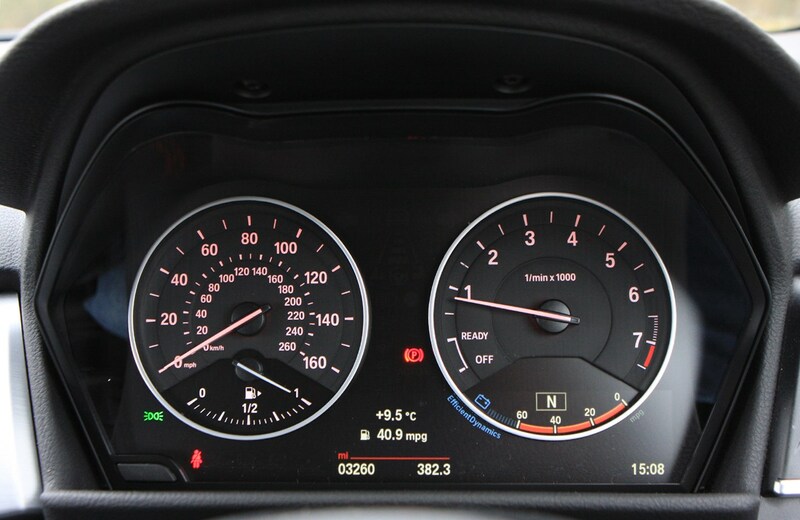 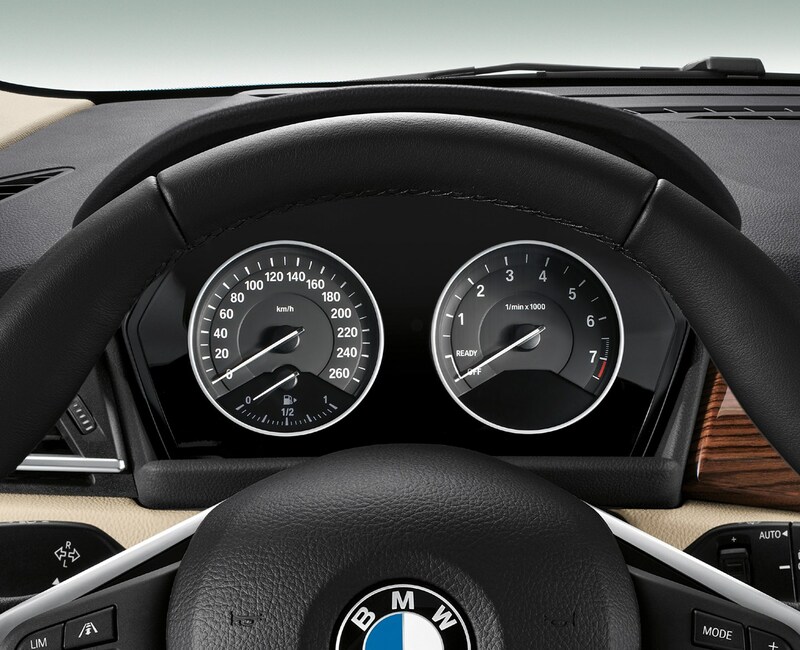 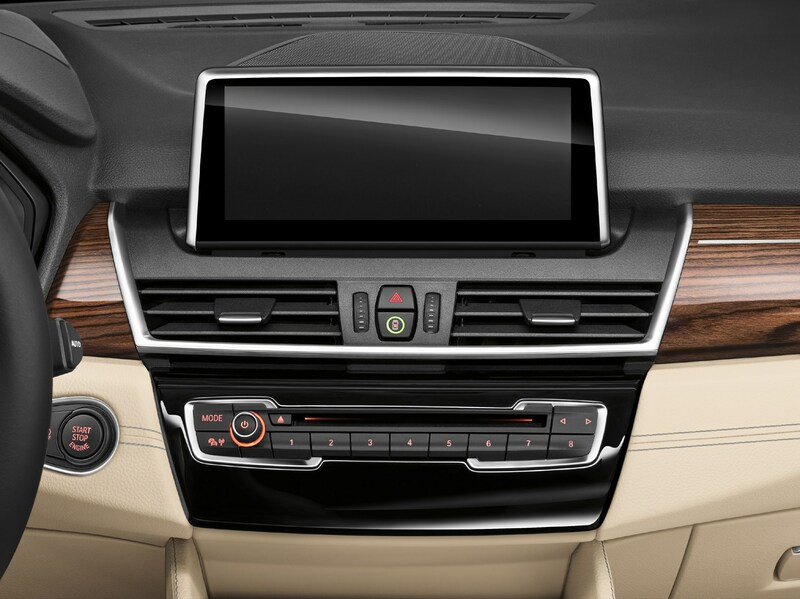 The layering design of the dashboard is something we’ve seen across the rest of the BMW range, as is the tablet-like freestanding multimedia display screen in the centre – while the instruments are very much like those found elsewhere. 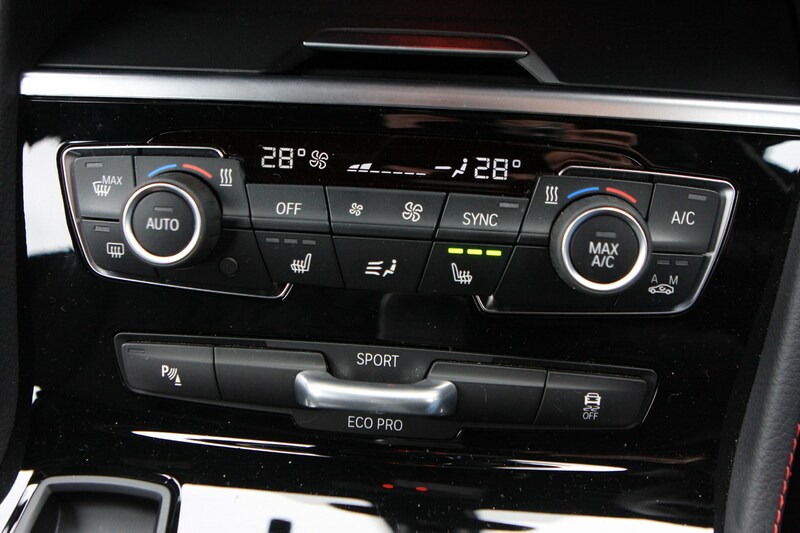 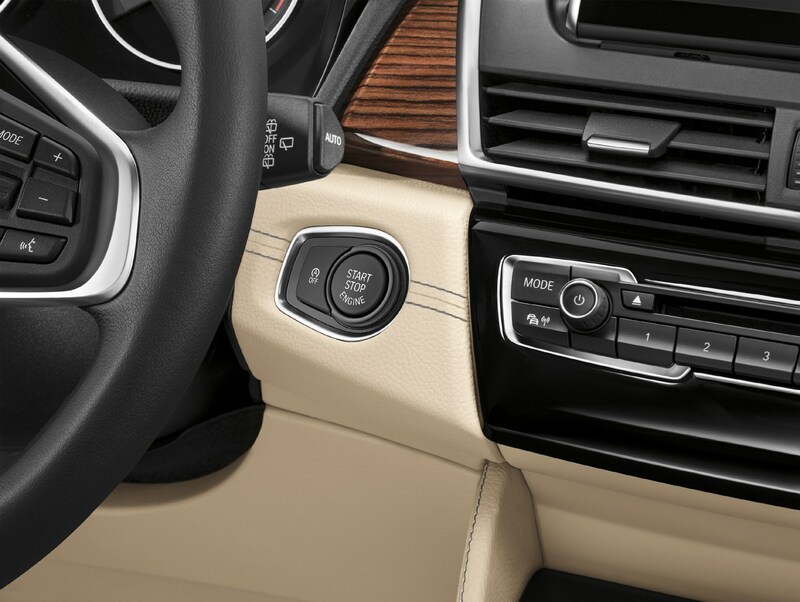 That said, some of the switchgear has received an update, the most noticeable being the climate controls which look vaguely reminiscent of an Audi system and the automatic gearlever is a different design to those we have seen recently from the firm. 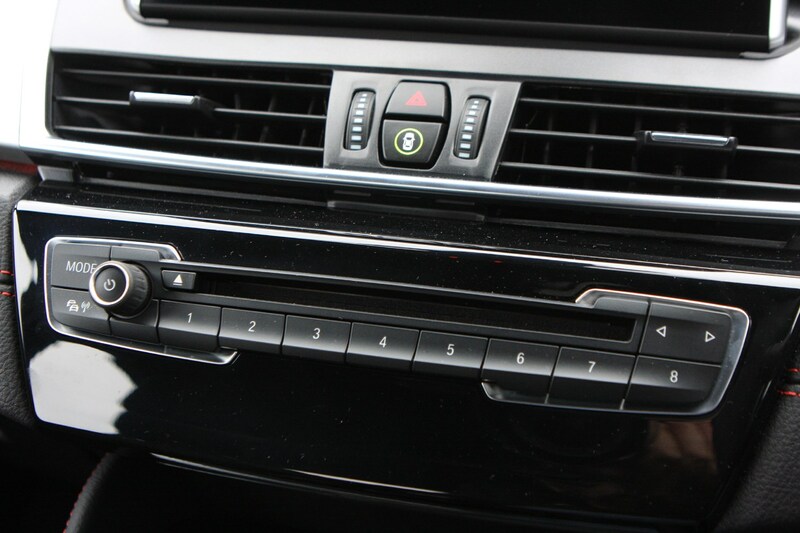 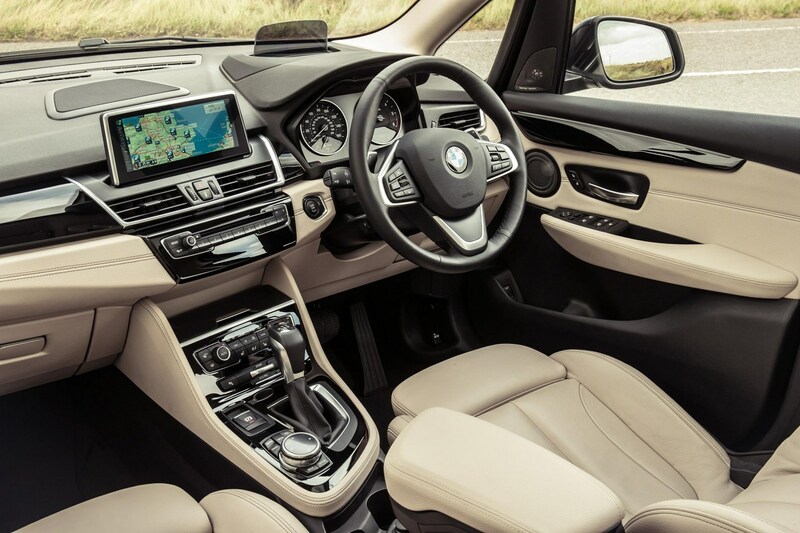 You’ll probably need to take some time to familiarise yourself with the iDrive interface, unless you’re already a BMW owner – in which instance you’ll wonder how you ever managed without such an intuitive control system. 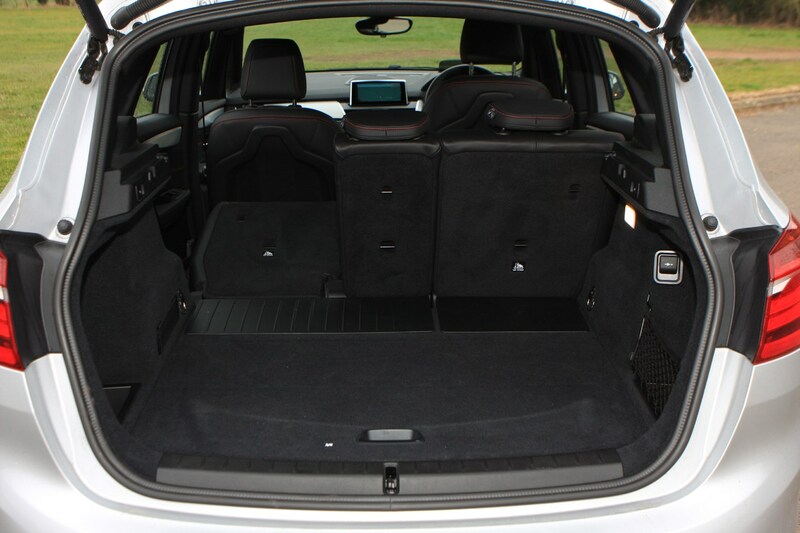 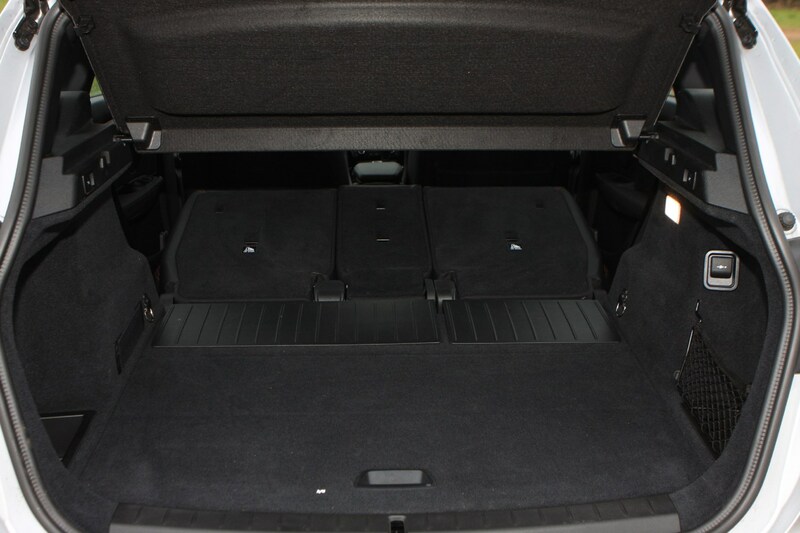 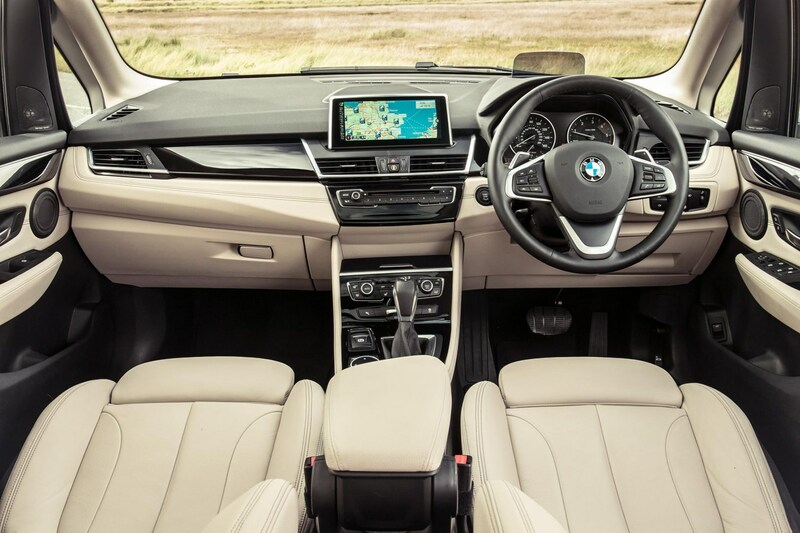 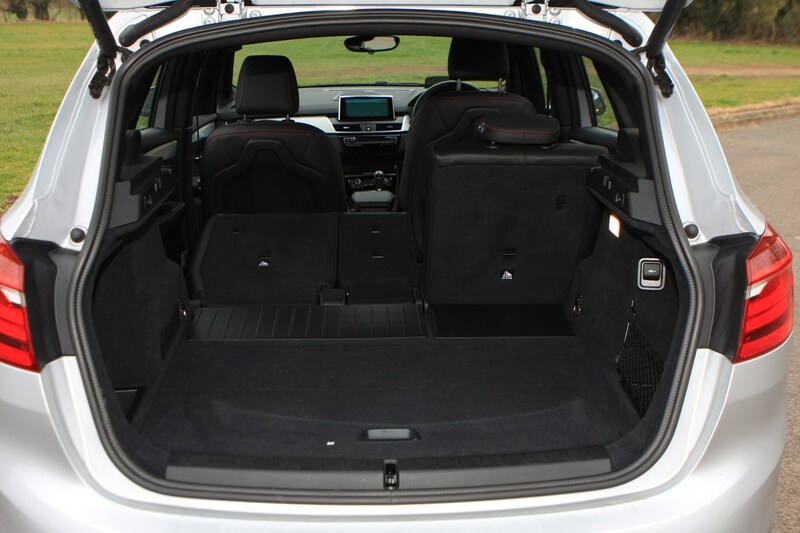 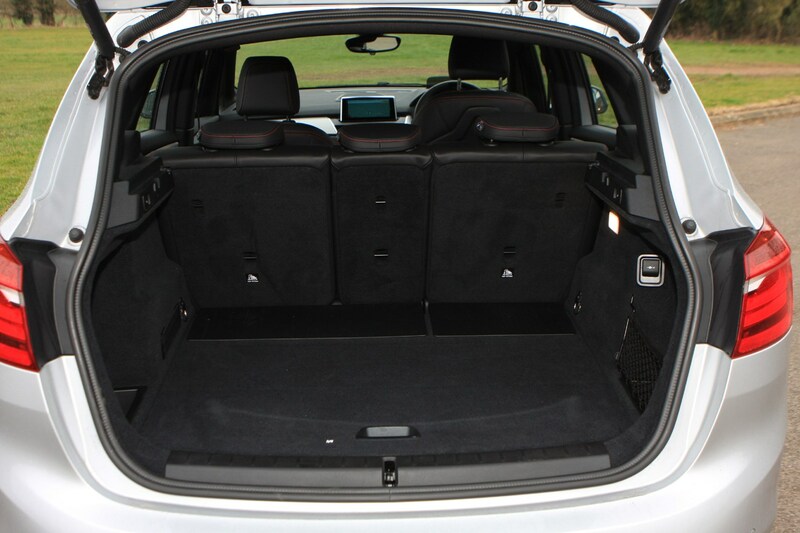 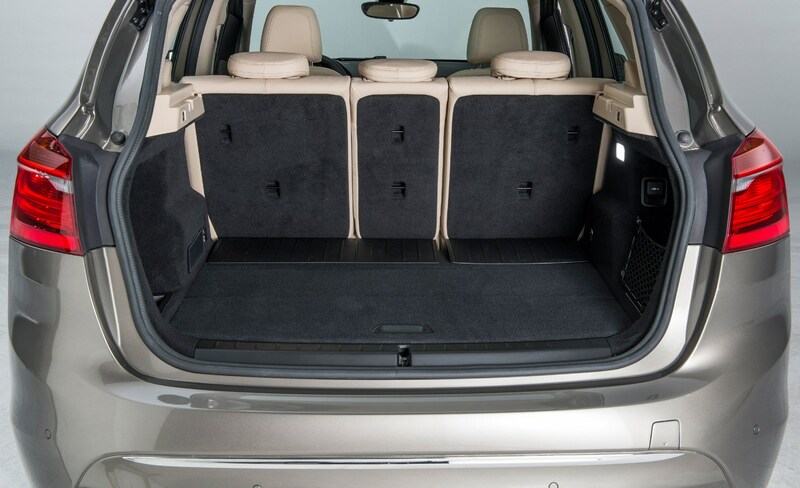 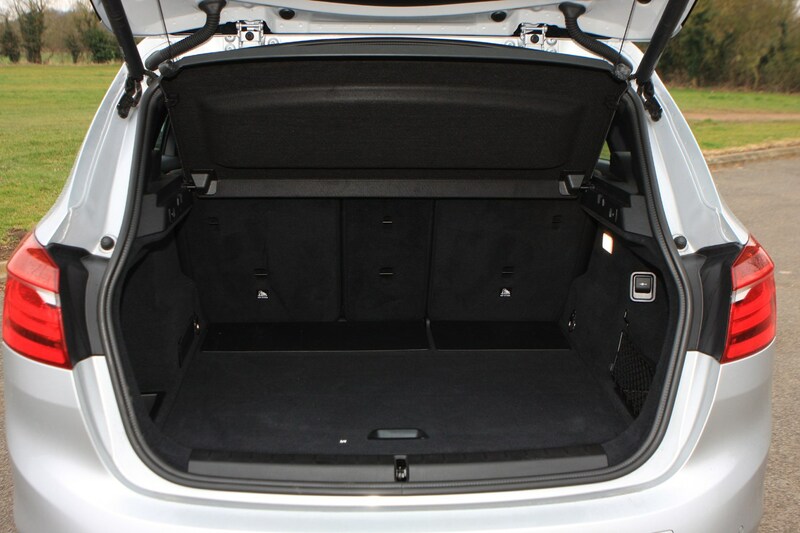 Add to that excellent material quality, fit and finish, plus neat switchgear and the 2 Series Active Tourer’s cabin is one of the highlights. 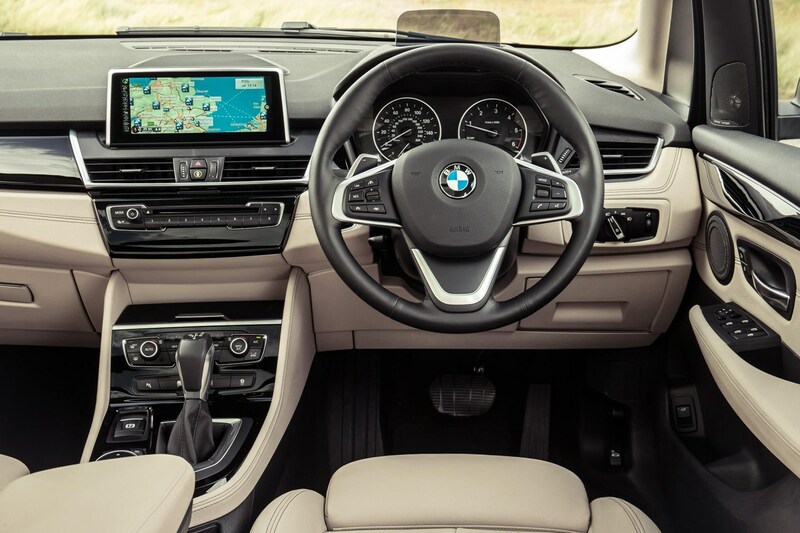 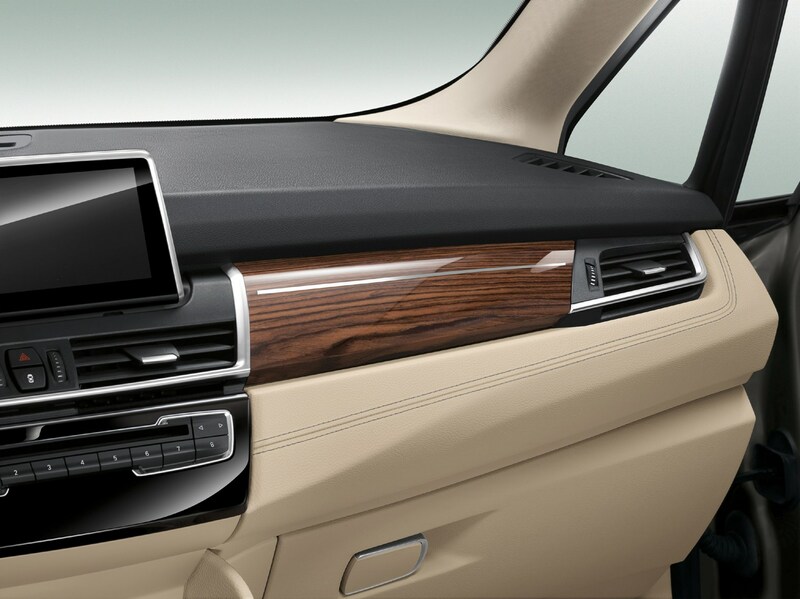 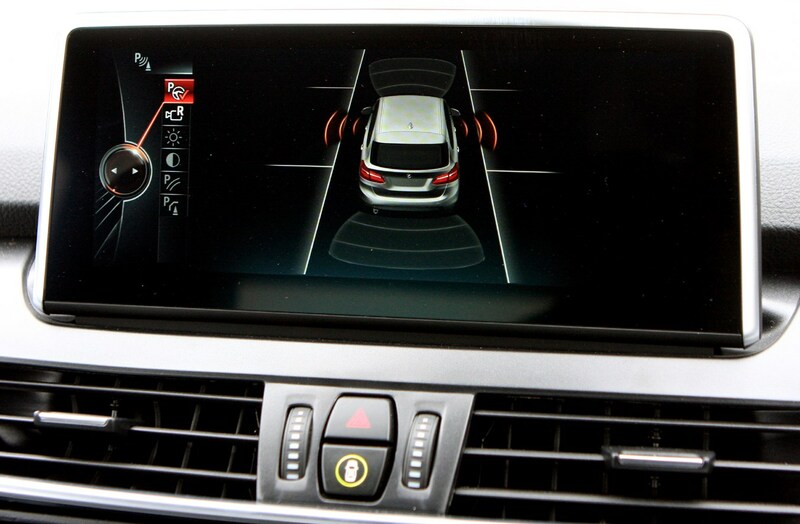 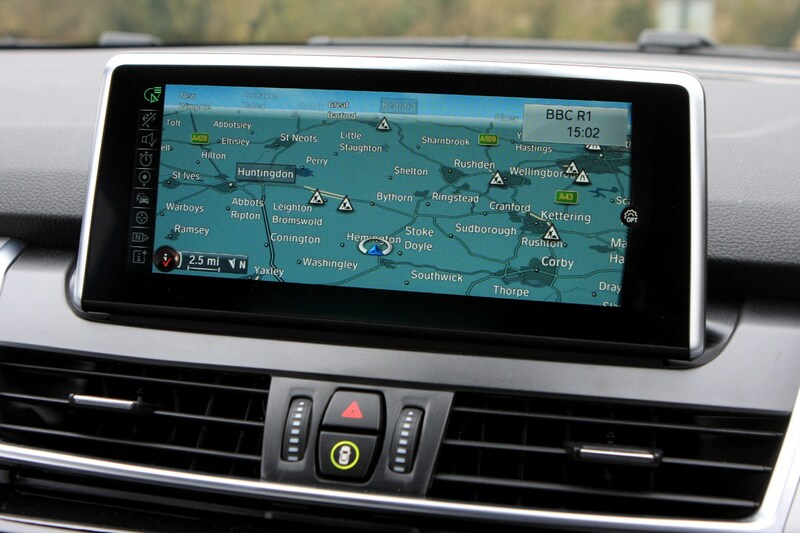 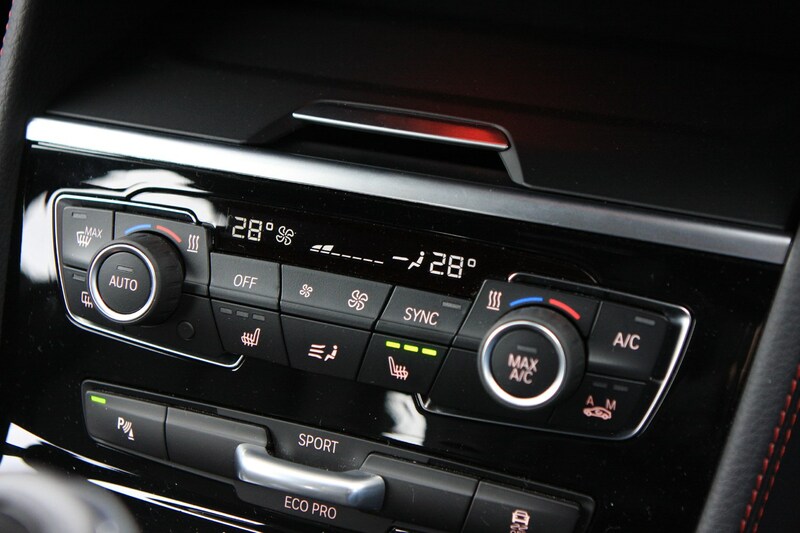 From July 2017, BMW installed its latest Professional 8.8-inch iDrive infotainment package in the Active Tourer, which includes a built-in SIM card along with a Wi-Fi hotspot, Microsoft 365 connectivity, enhanced voice control capability using real speech, real-time traffic information with time-to-leave notifications, and optional Apple CarPlay connectivity. 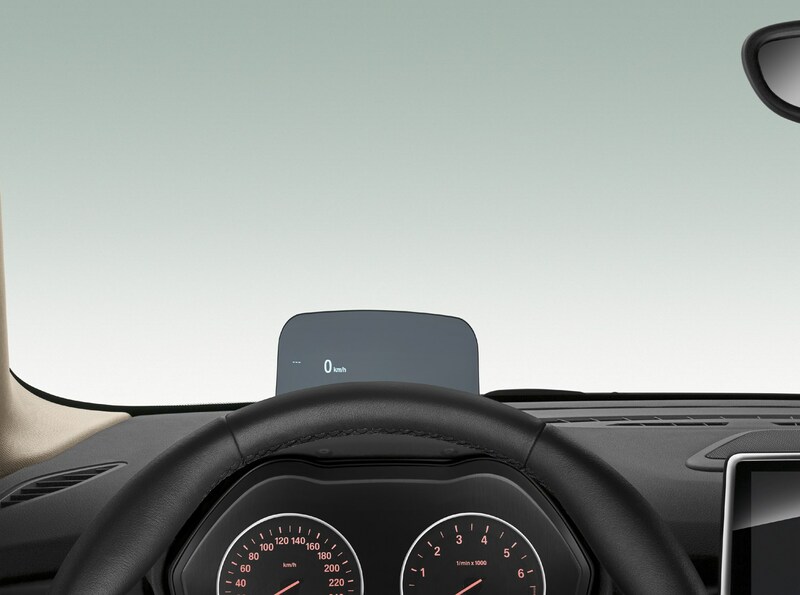 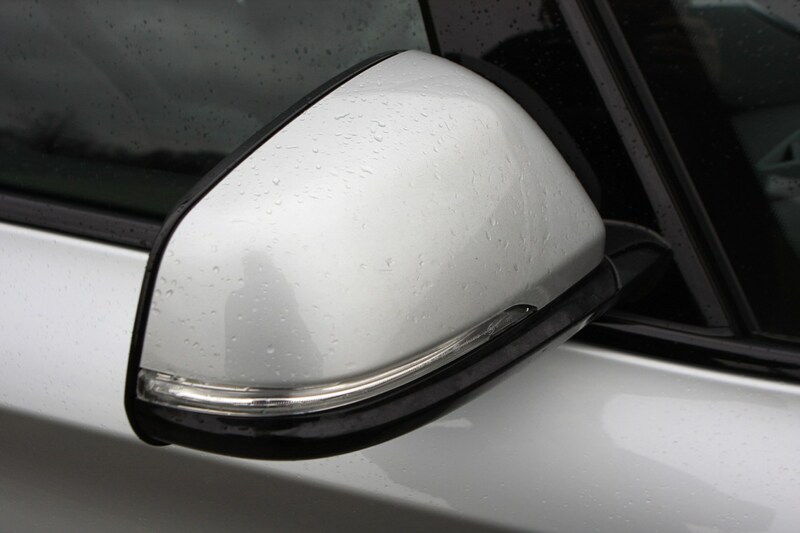 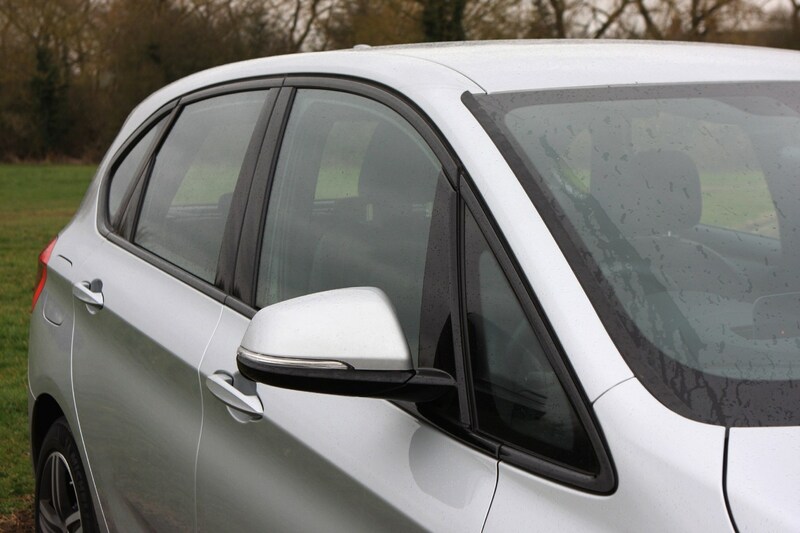 A clear head-up display features too, and we noticed that it’s one of the few systems on offer that works perfectly with polarised sunglasses – though during some types of driving (like dusk or in heavy rain) it can become a little distracting. 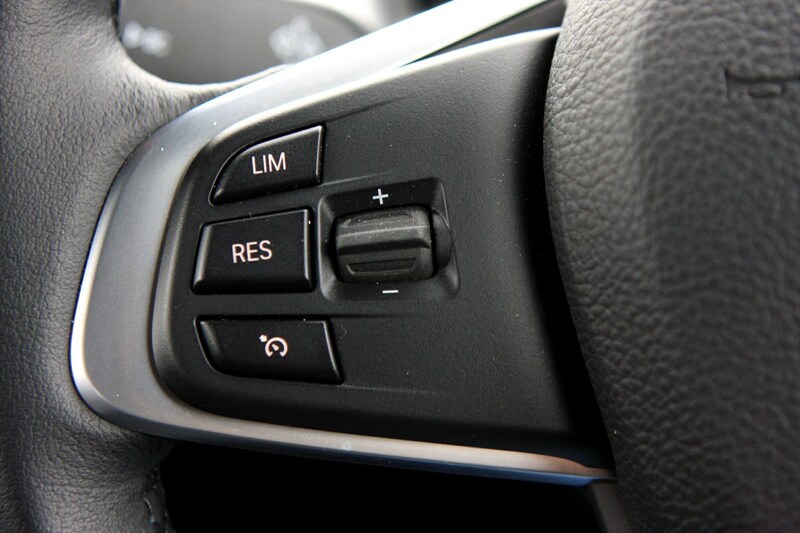 You can switch it off, though. 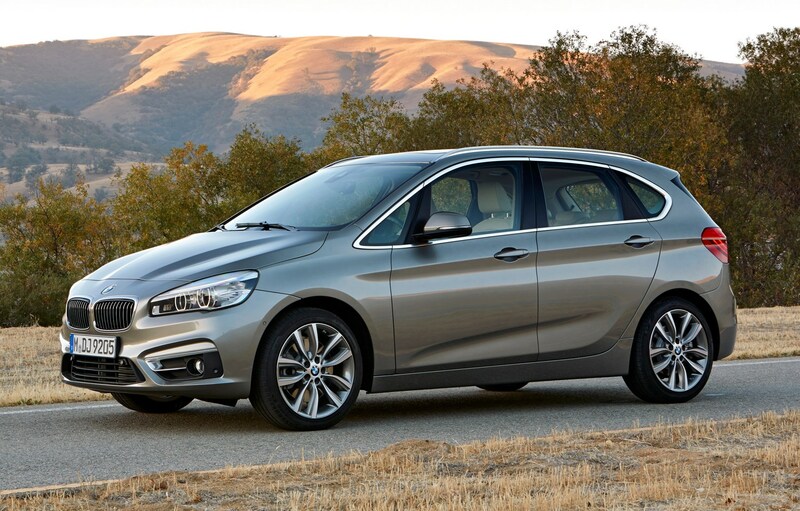 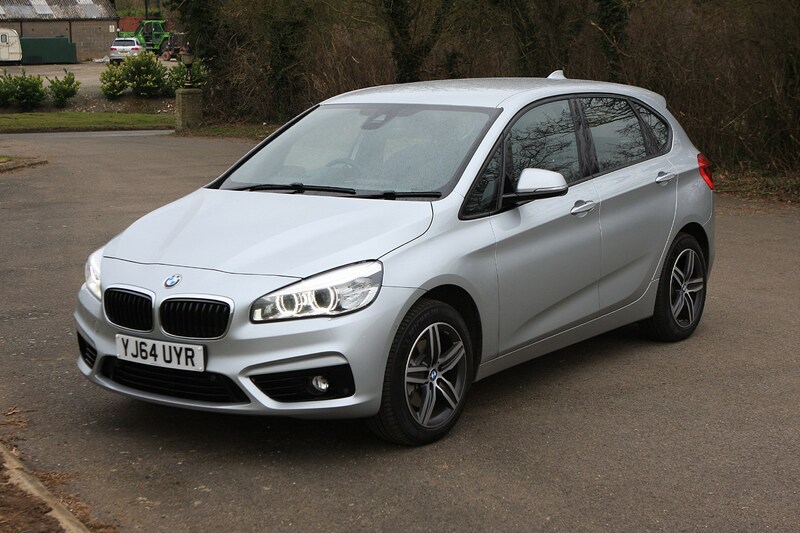 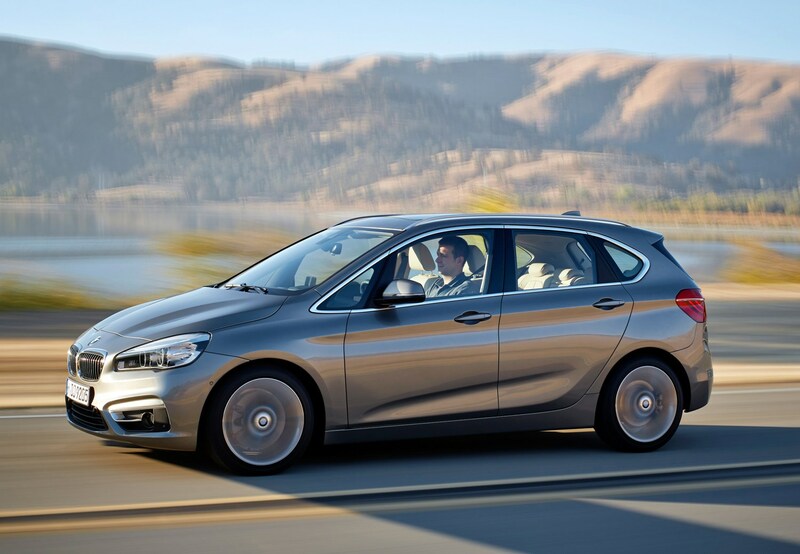 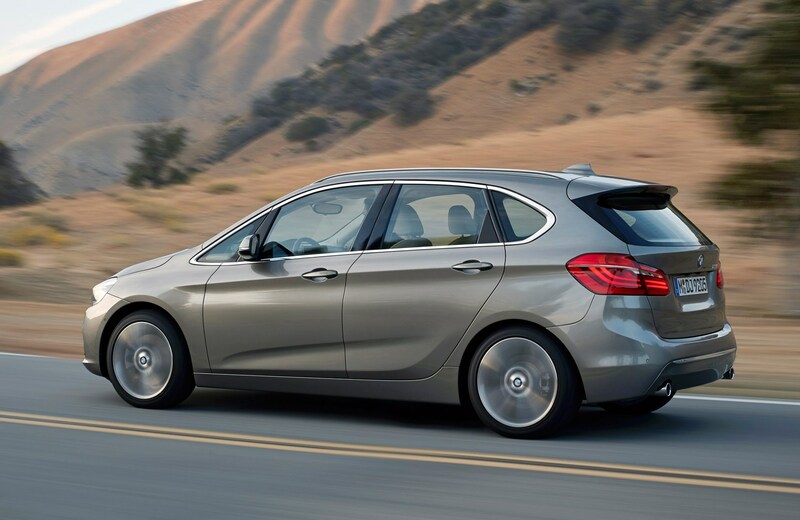 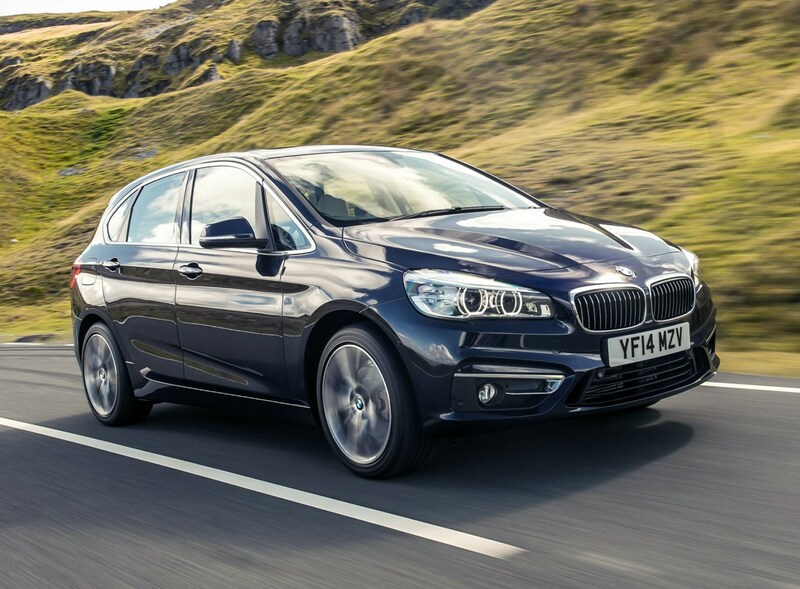 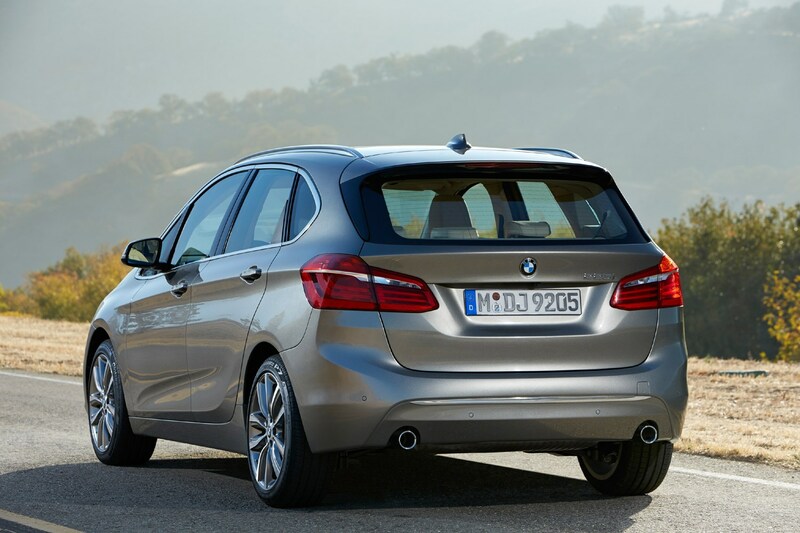 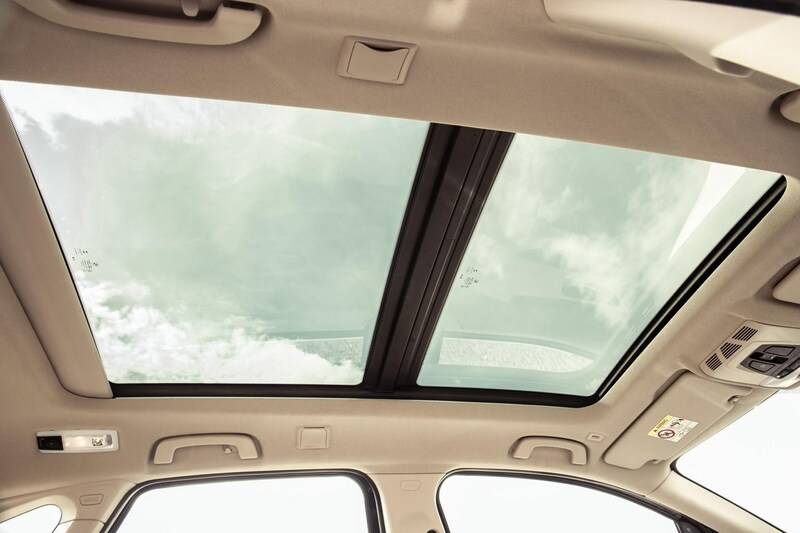 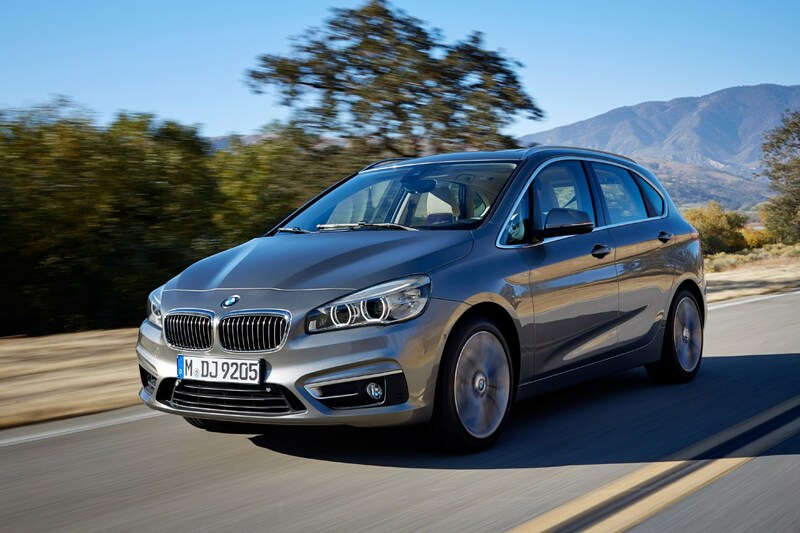 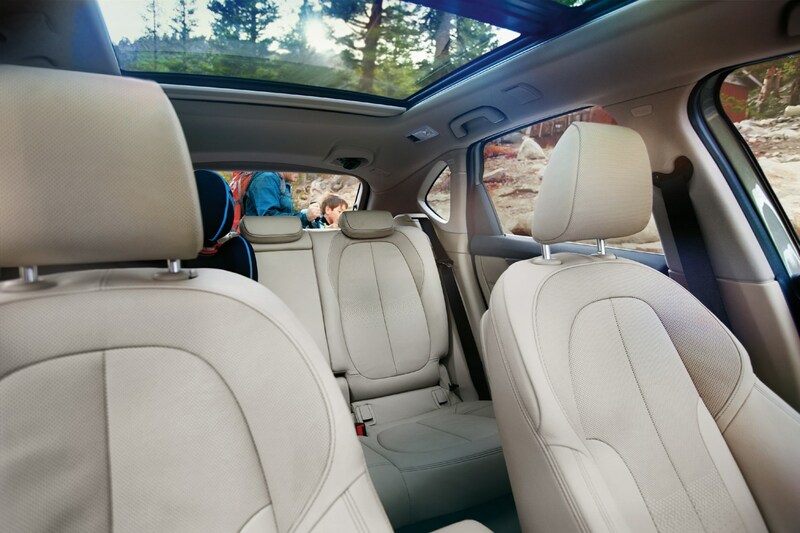 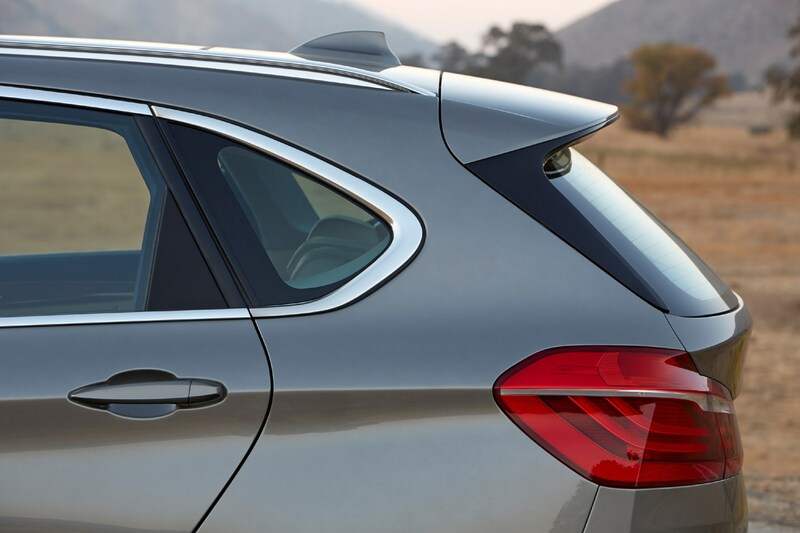 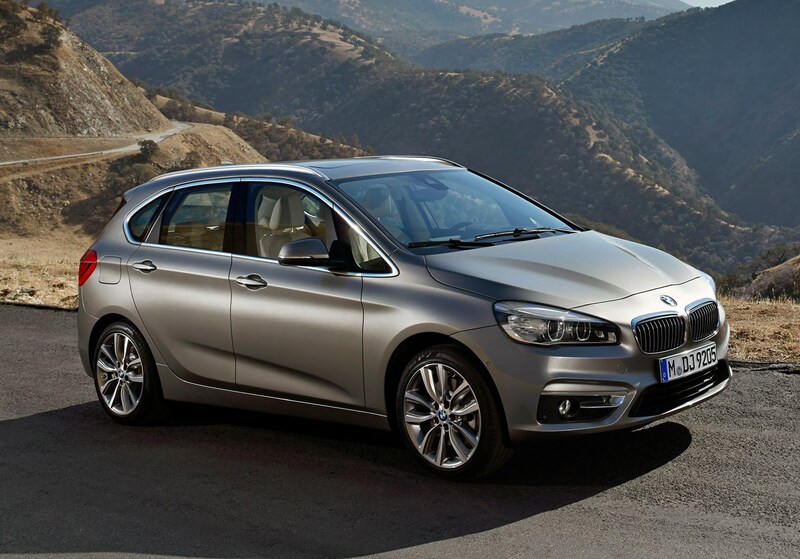 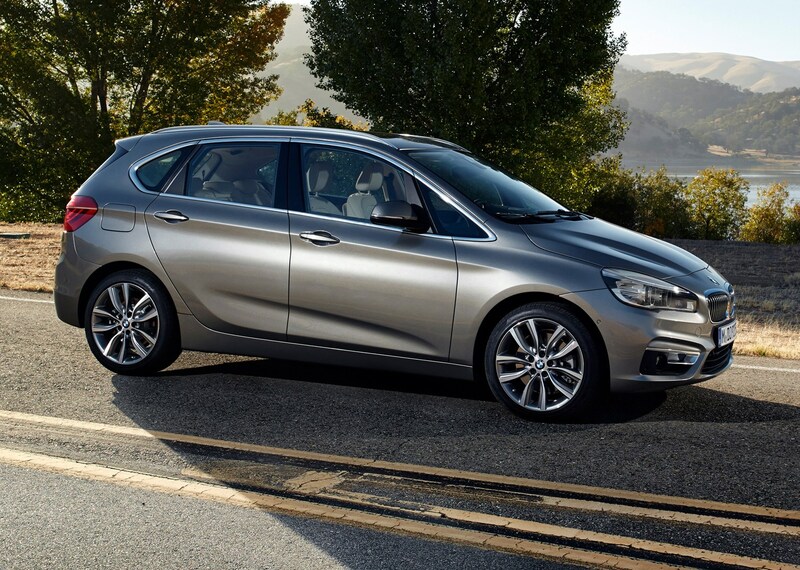 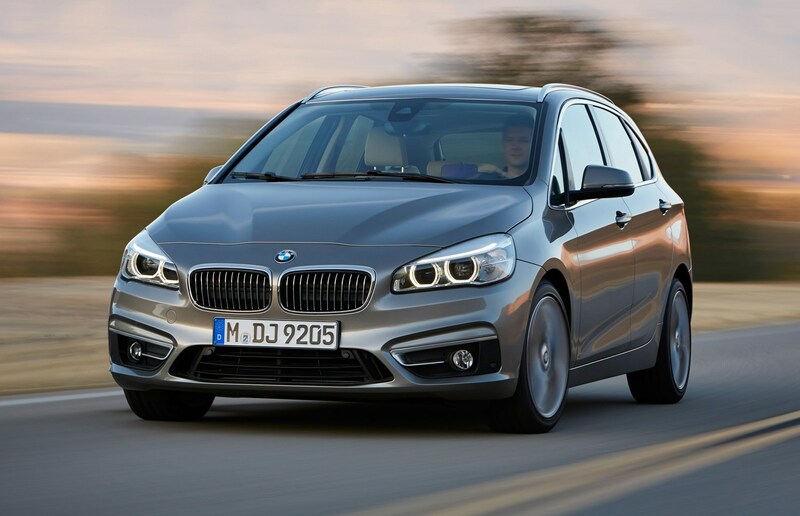 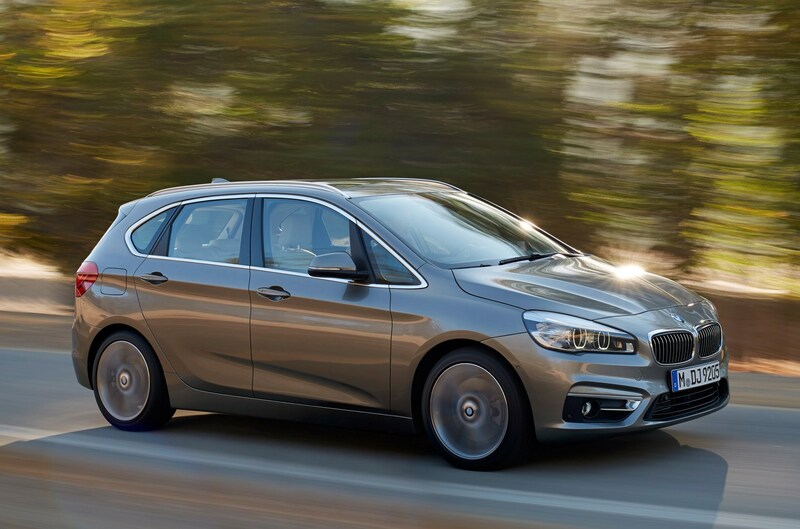 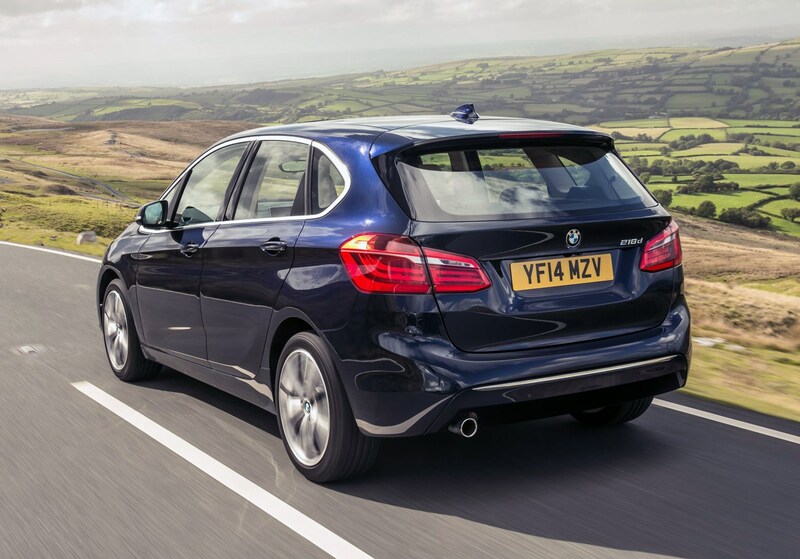 Built to transport families, it should be no surprise that comfort was near the top of the BMW 2 Series Active Tourer’s priority list during development. 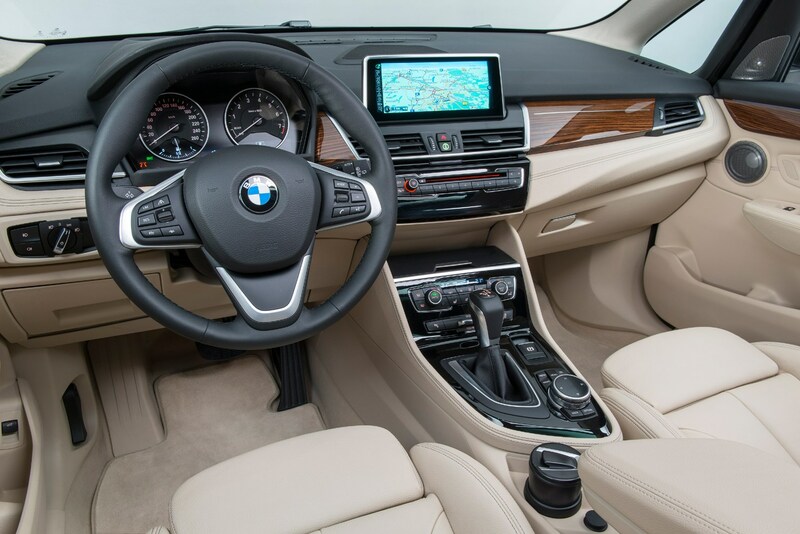 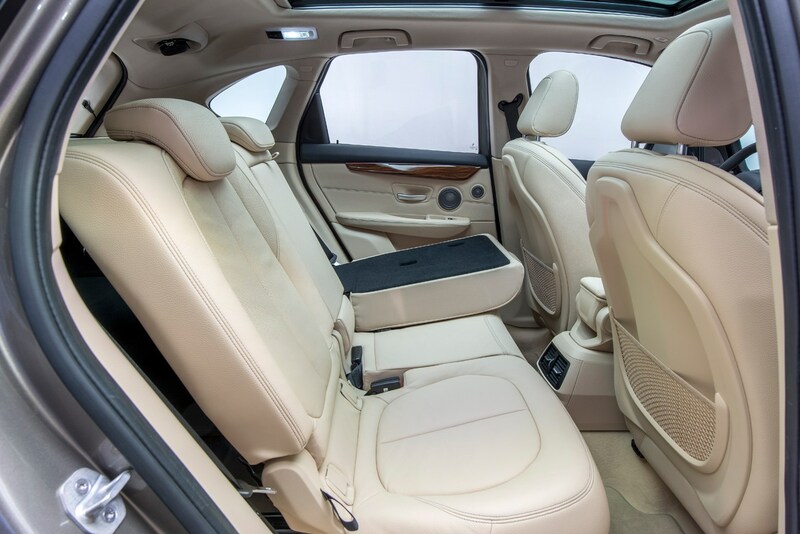 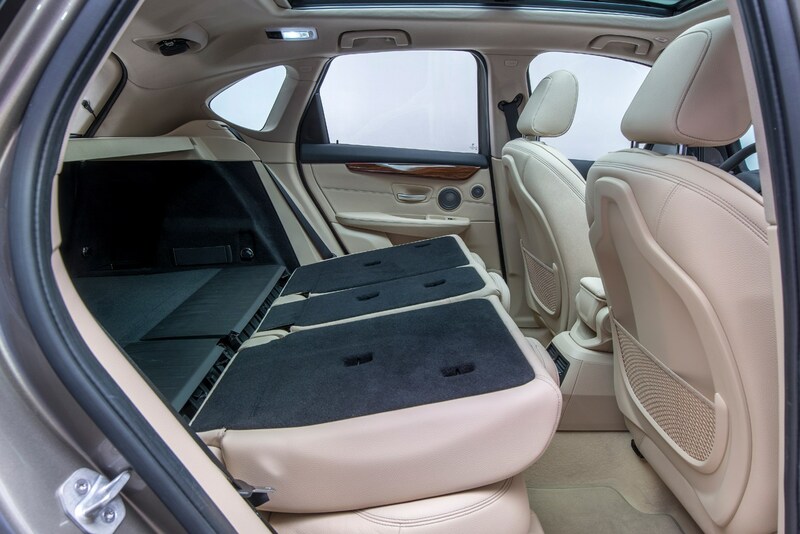 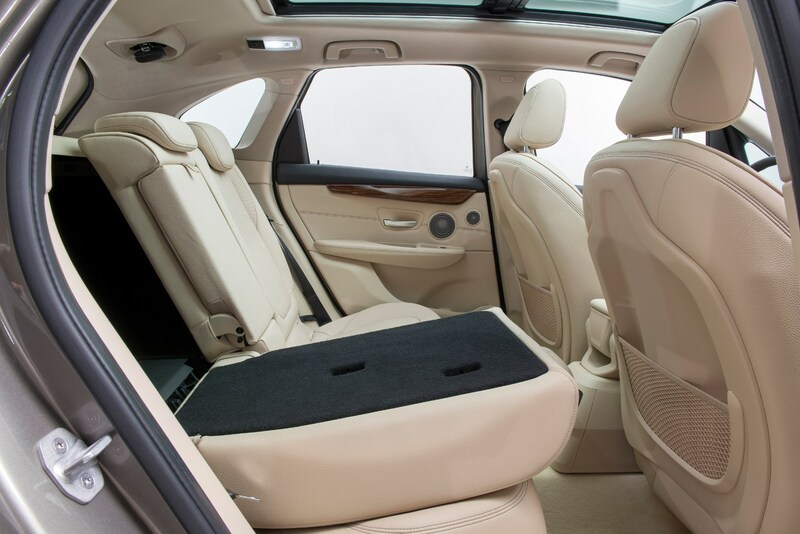 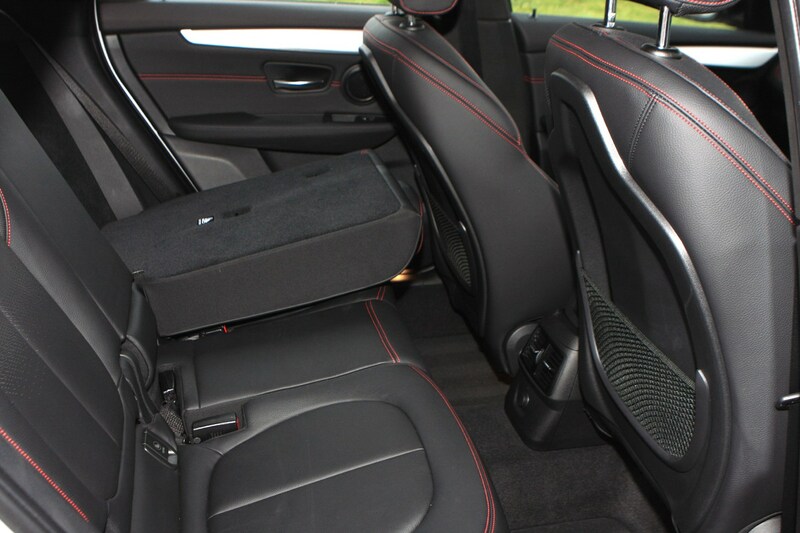 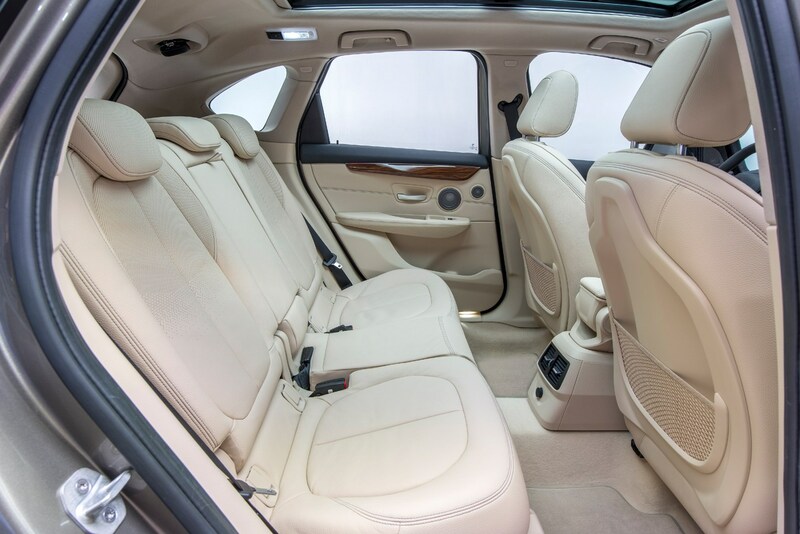 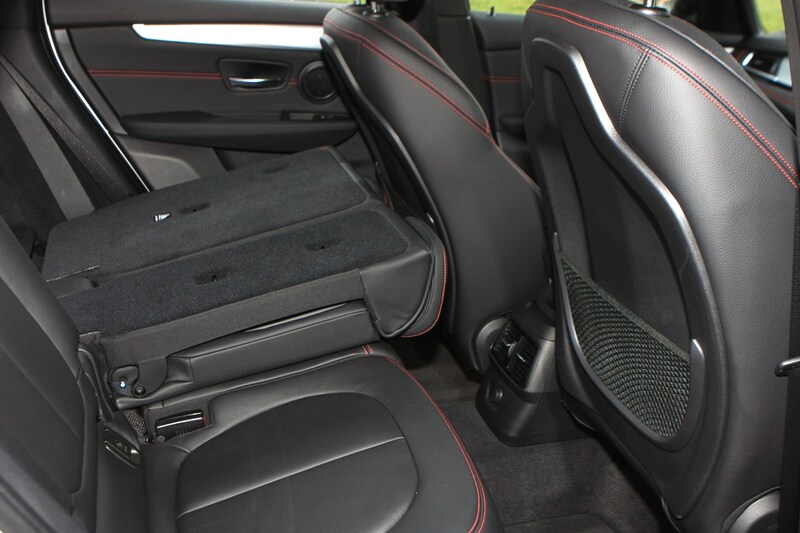 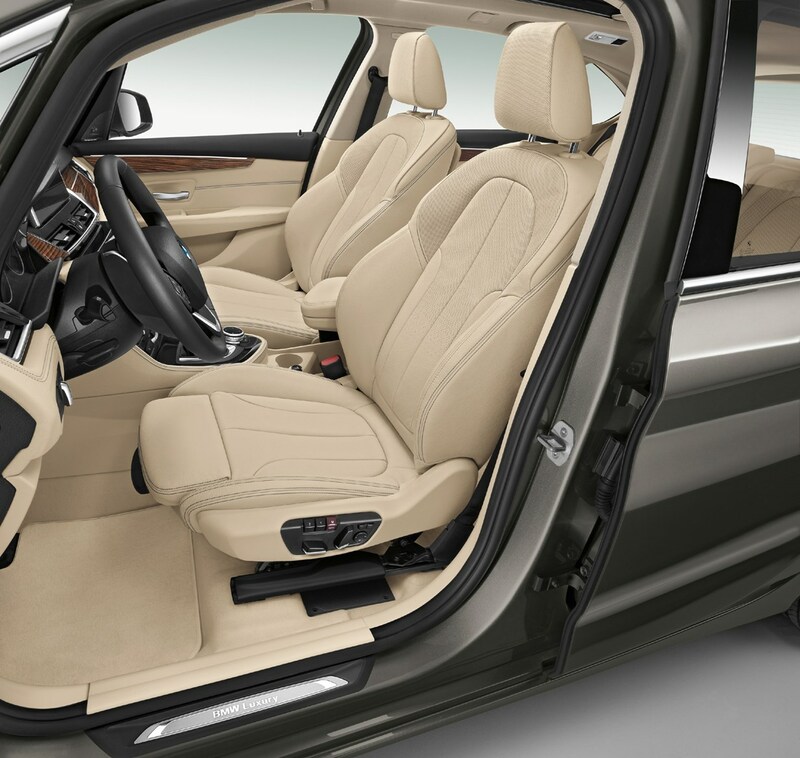 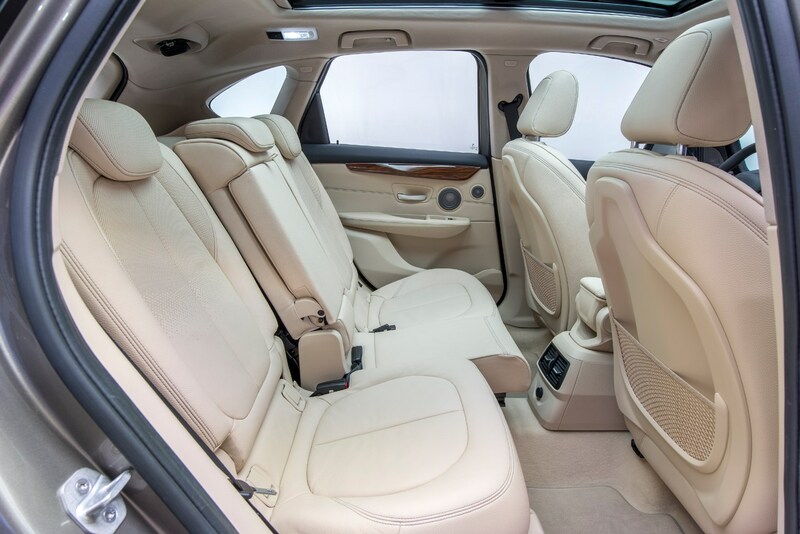 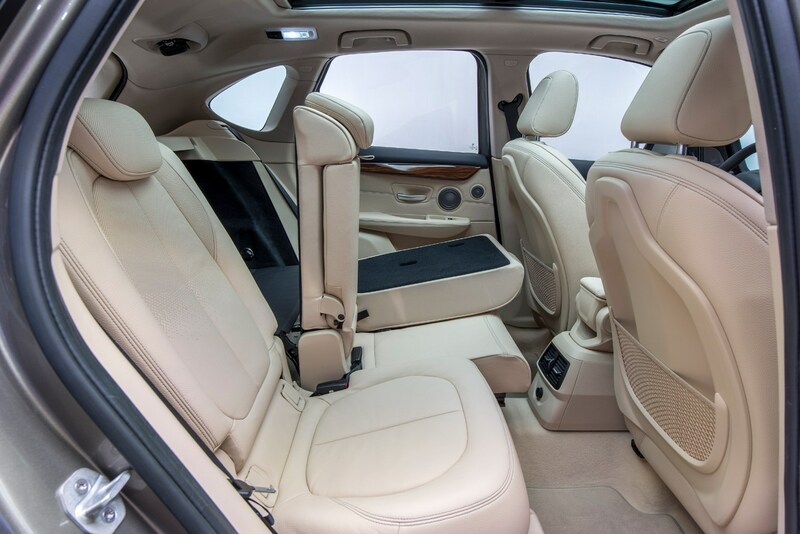 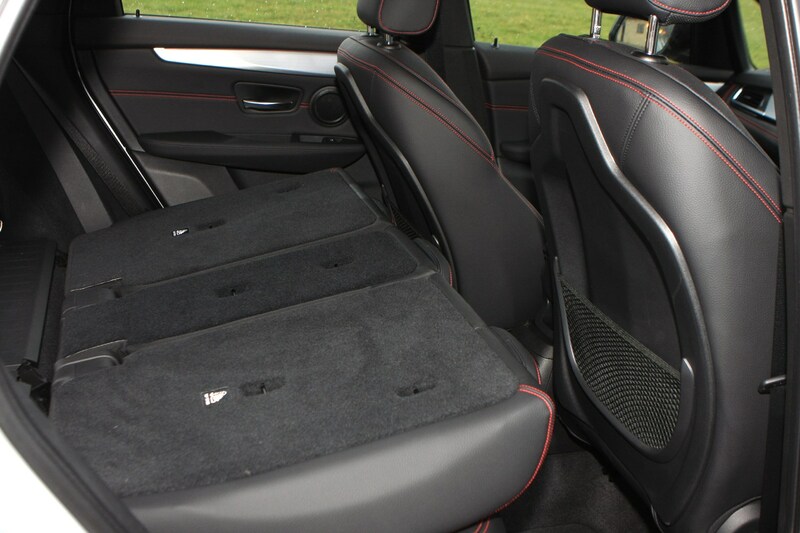 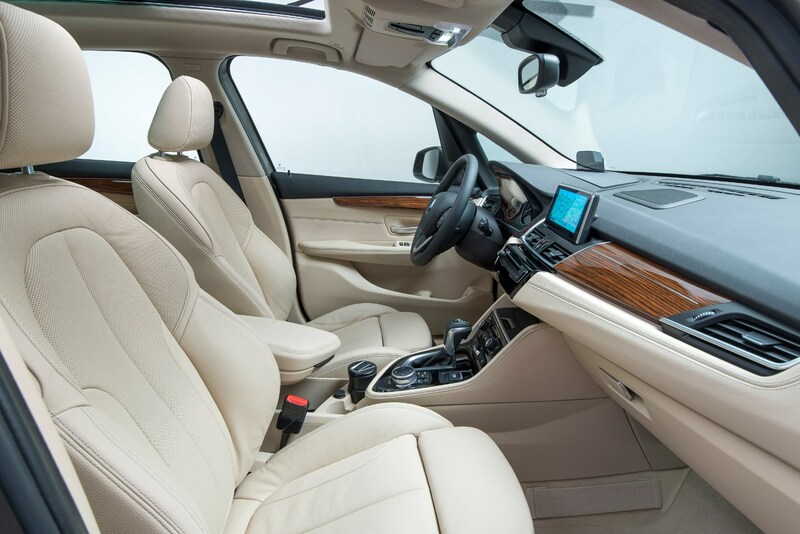 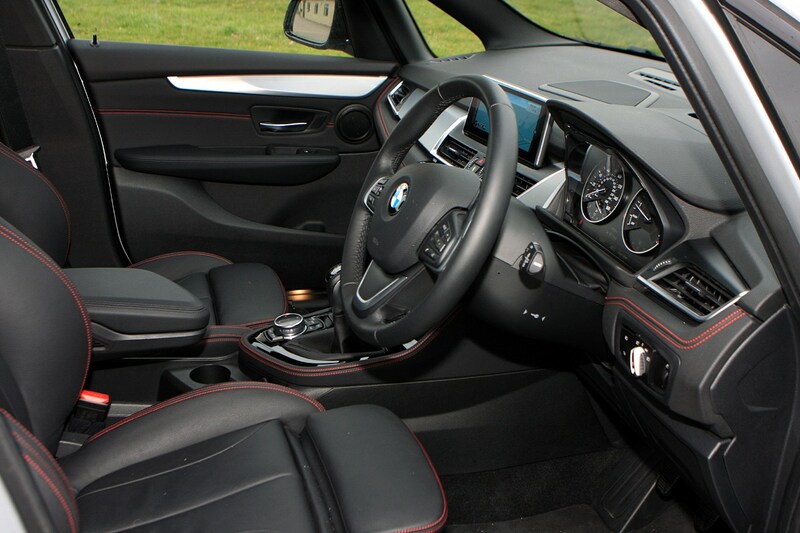 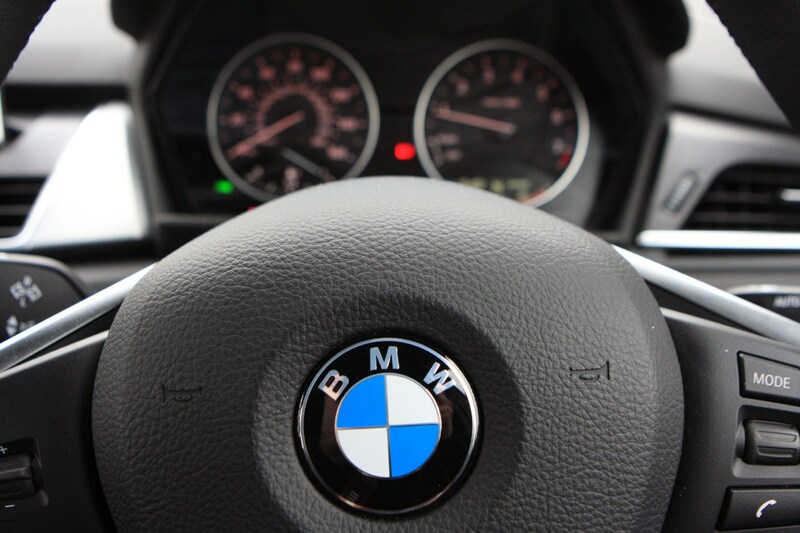 Certainly, the seats are typically BMW in their breadth of adjustment – there’s plenty, and no excuse for not finding the right driving position. 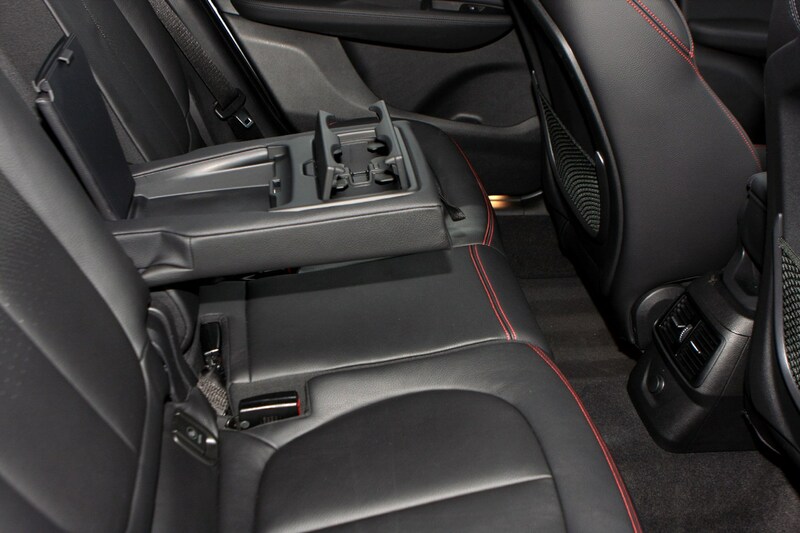 That said, you do sit 30mm higher than in the maker’s X1 SUV, and it feels high from the driving seat. 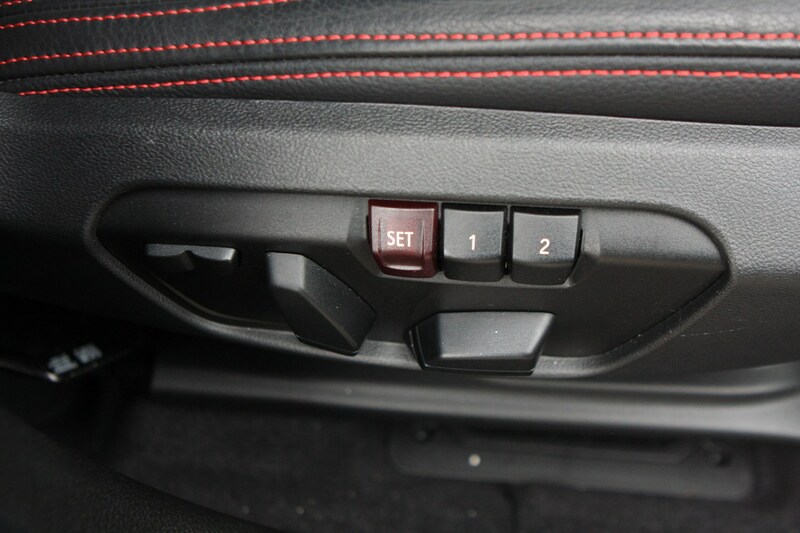 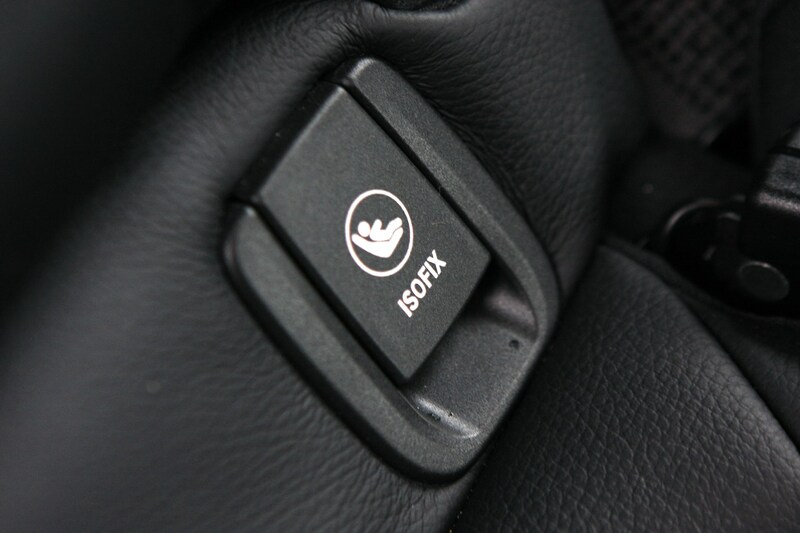 Along with the seat adjustment up front, there’s plenty of reach and rake movement in the steering wheel too. 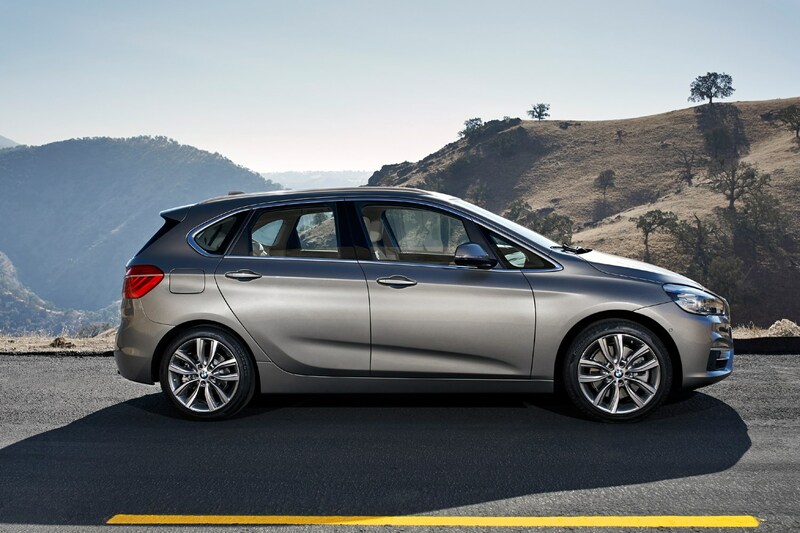 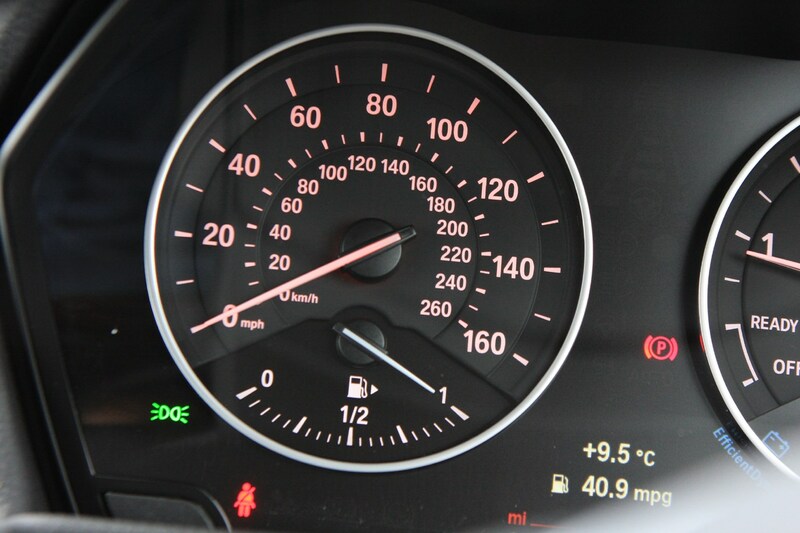 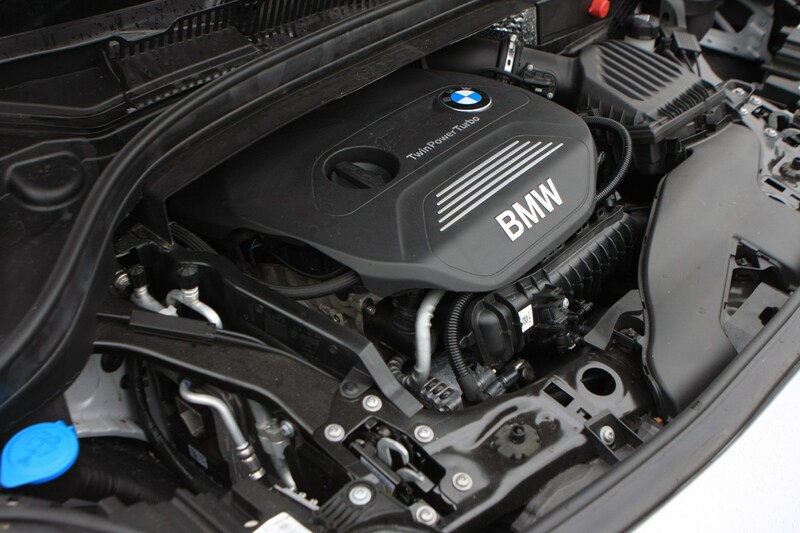 On the move, especially in the three-cylinder petrol model, the 2 Series Active Tourer impresses; with this engine the most noticeable noise is from the wind, rather than the pistons – unless you’re really accelerating hard. 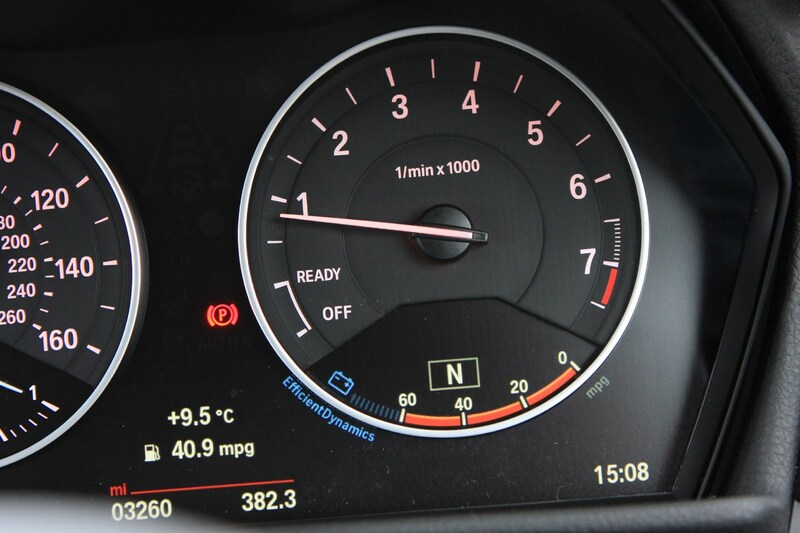 The diesel isn’t quite as refined, but again once you’ve reached your desired cruising speed it quickly settles to a hushed note, with only a little vibration through the controls. 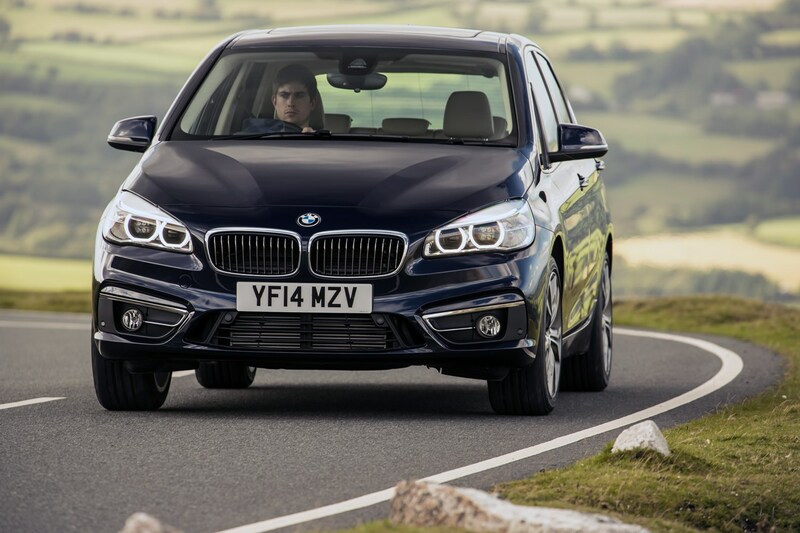 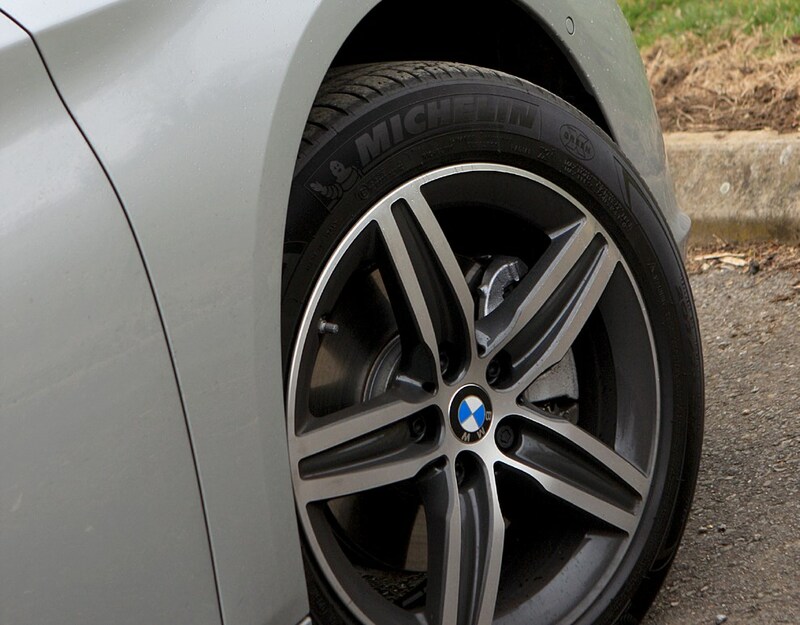 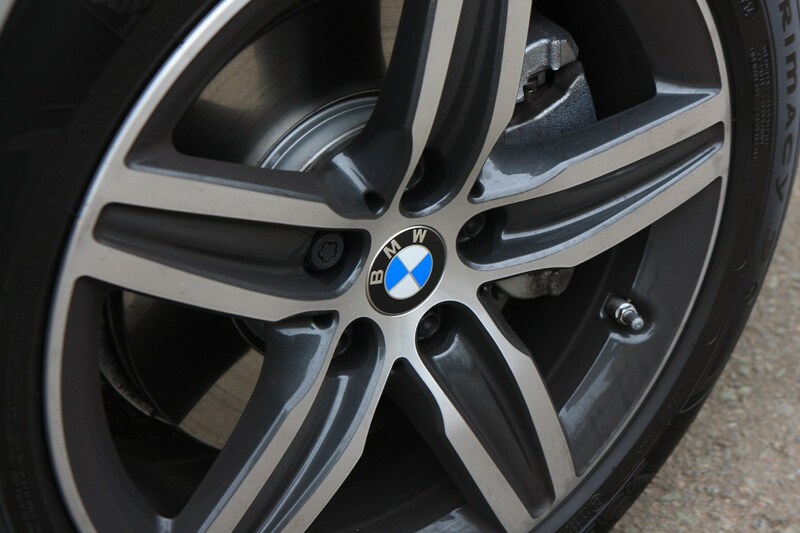 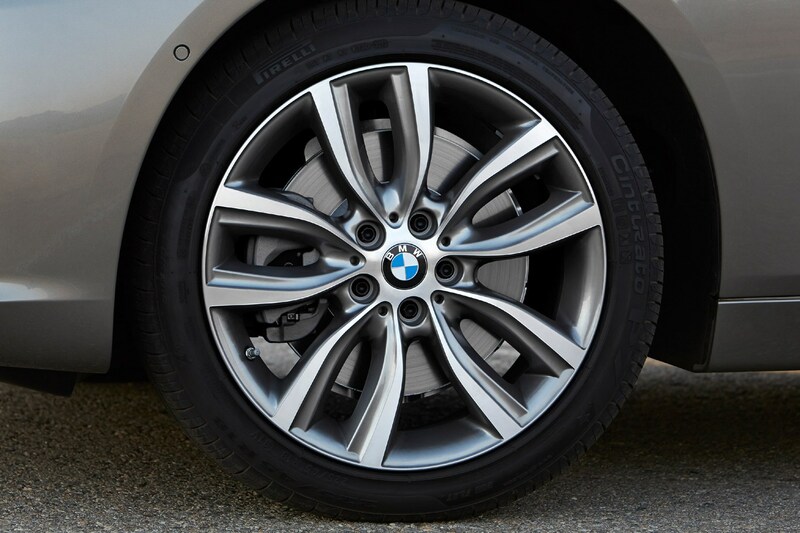 An underlying firmness to the suspension, which allows the BMW to corner better than a Citroen C4 SpaceTourer for example, does mean you can feel most of the ruts and bumps below you – and that’s without selecting Sport mode in the adjustable suspension. 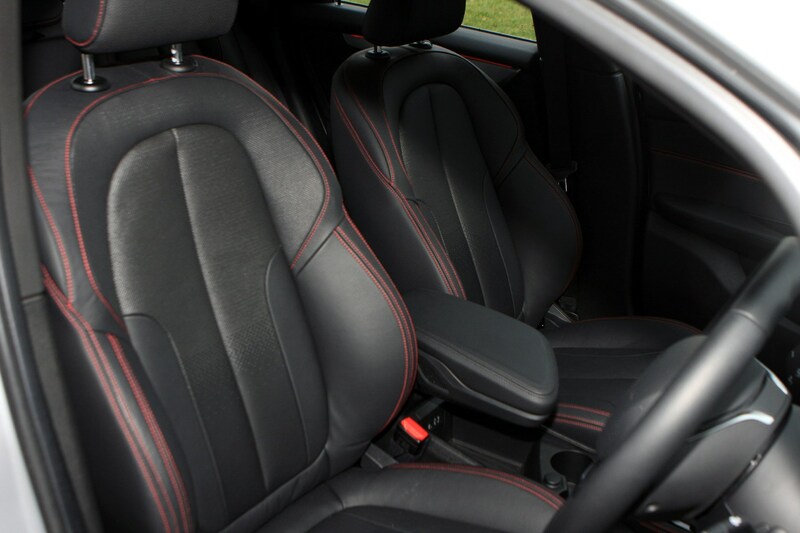 But while the ride isn’t pillow soft, it’s rarely wearing, and generally very well composed. 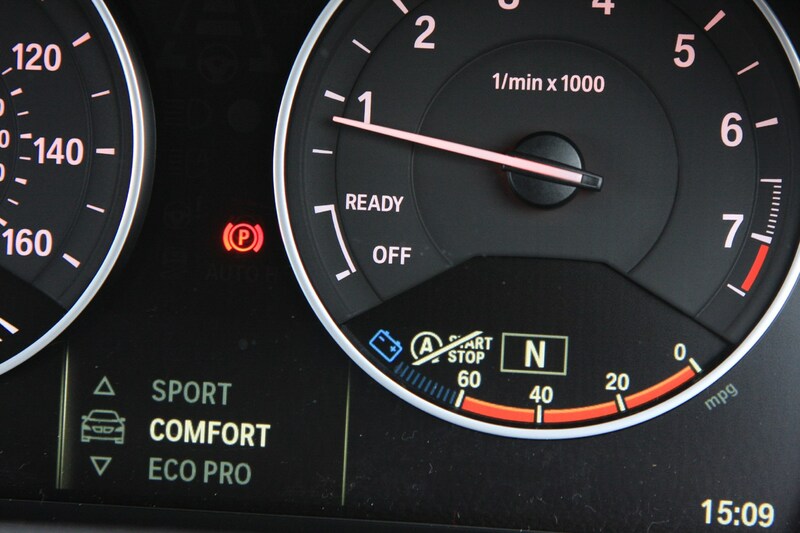 If comfort is your primary consideration you’ll find that a 225xe plug-in hybrid should fit the bill nicely. 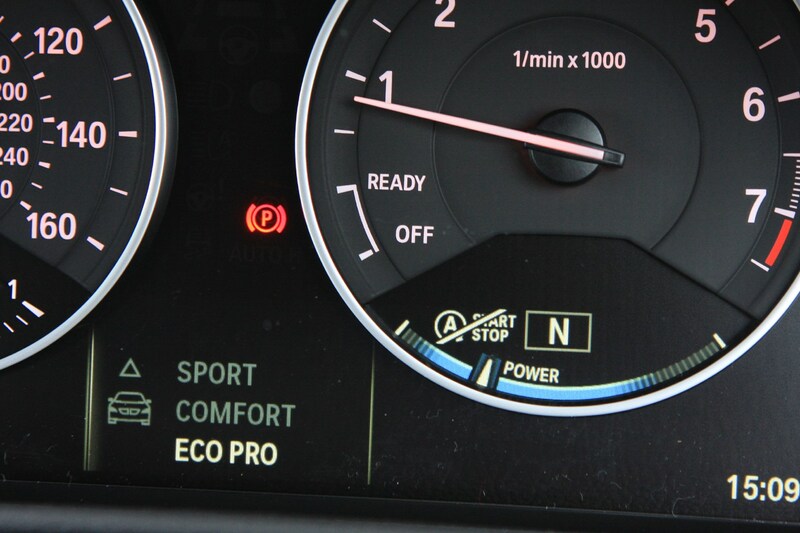 This is because it runs in near-silence when on electrical power, and with a theoretical range of 28 miles it’s possible many drivers could use this model without using any fuel at all as a city commuter car.